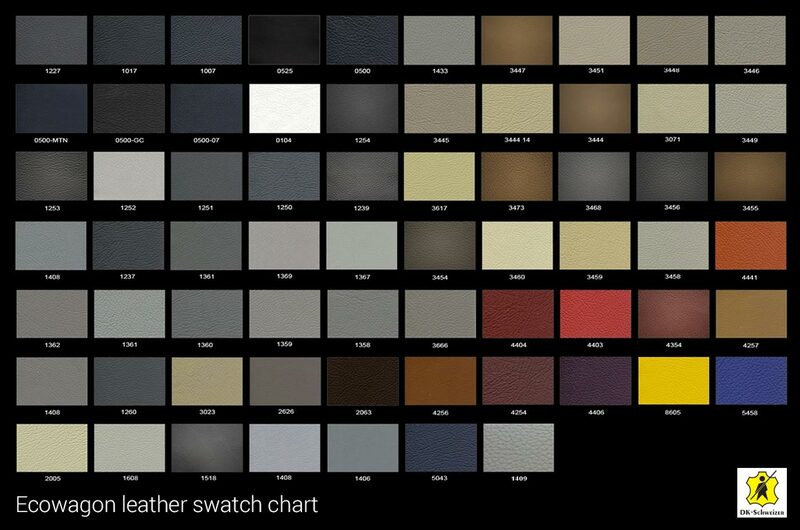 We know what you’re thinking… Which colours can I choose? What finishes are available? 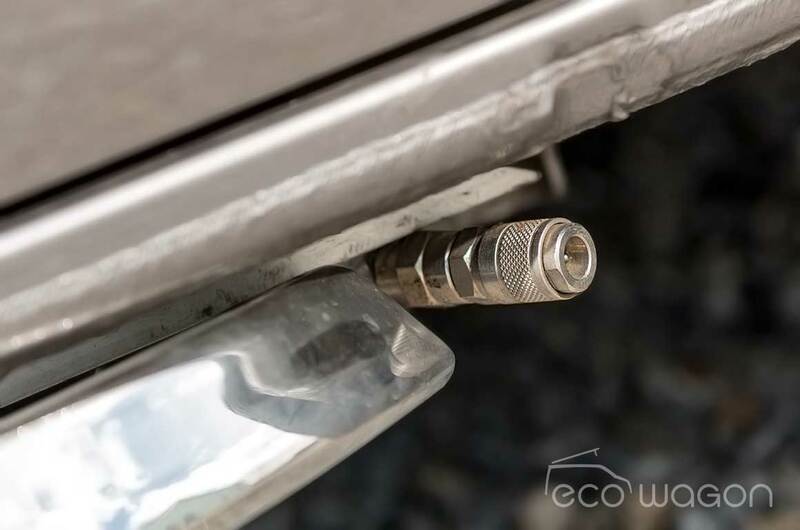 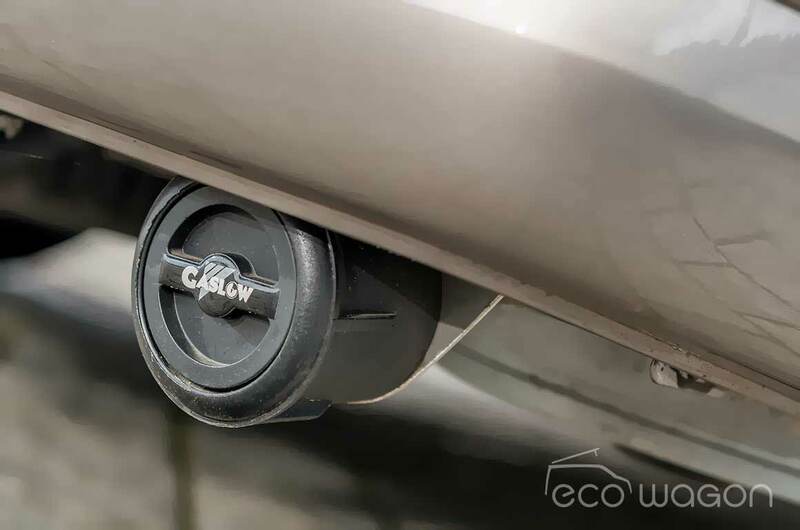 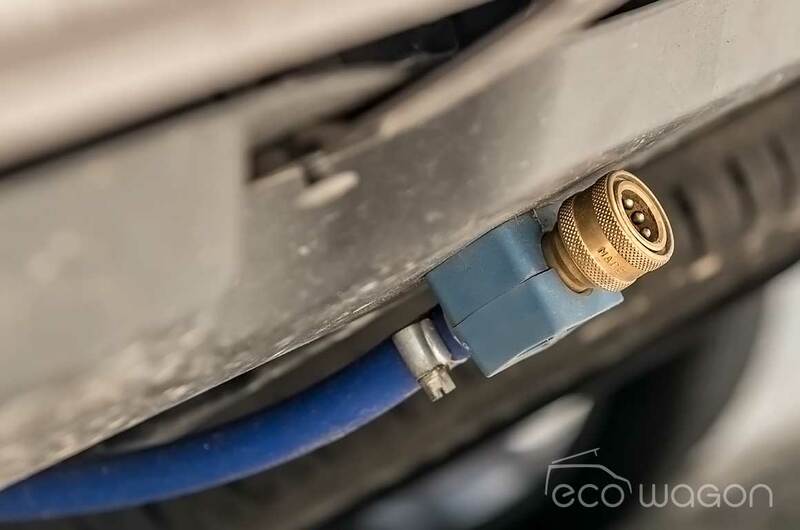 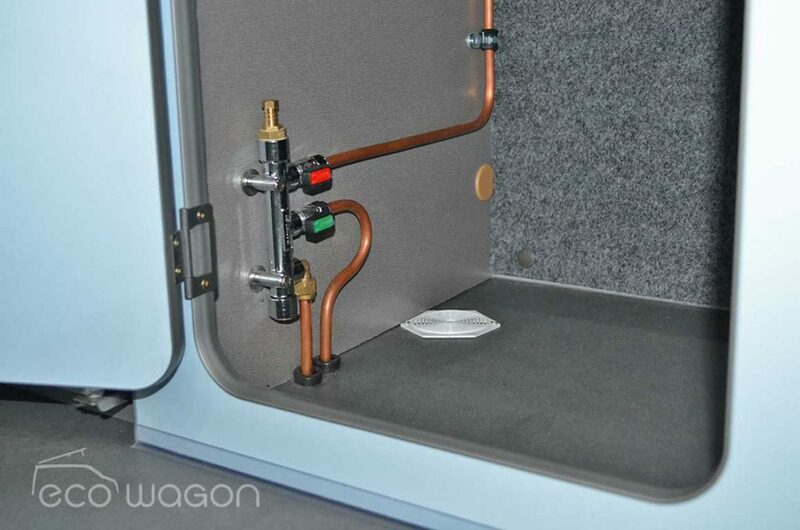 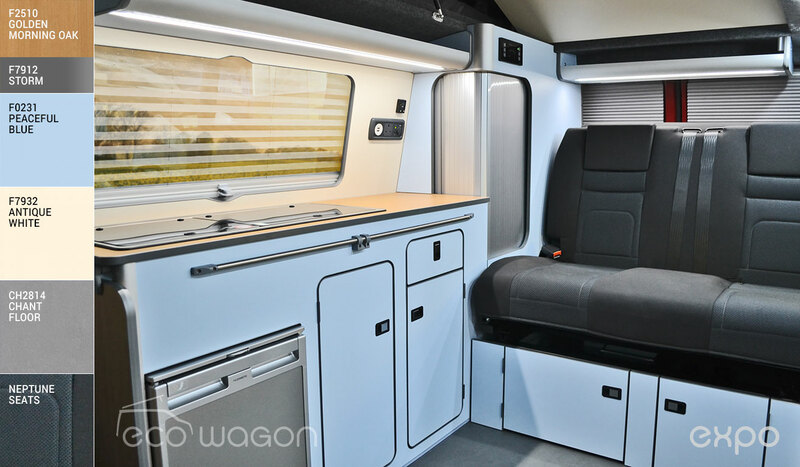 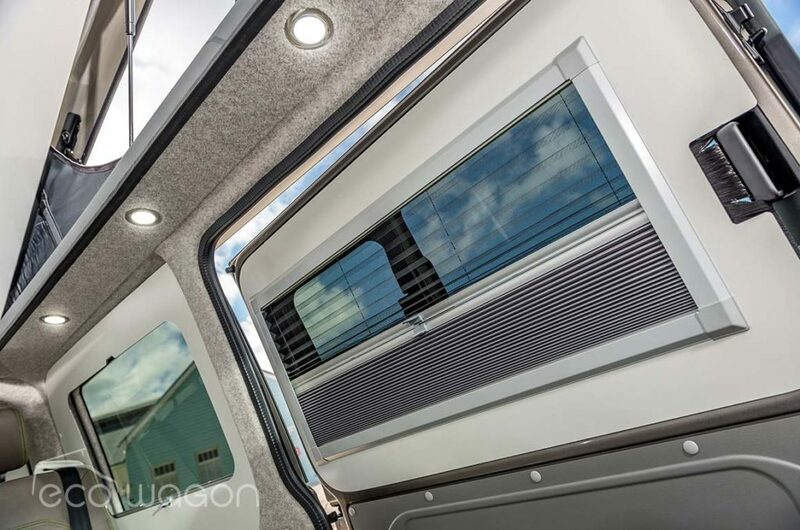 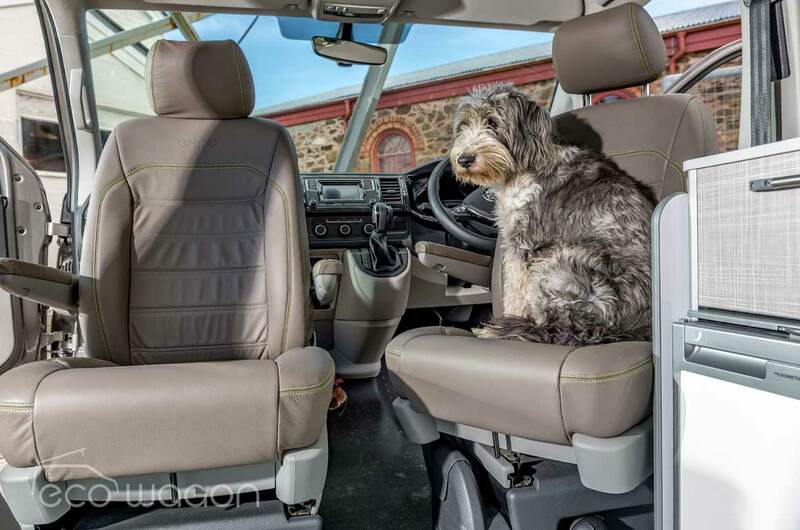 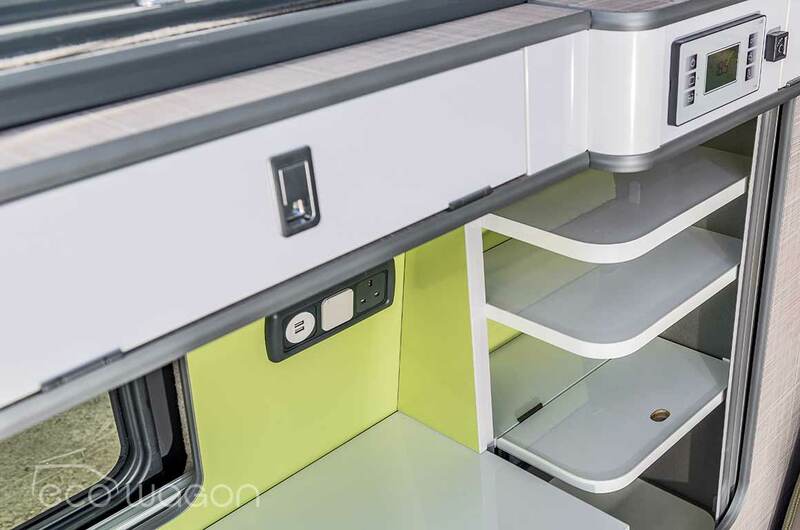 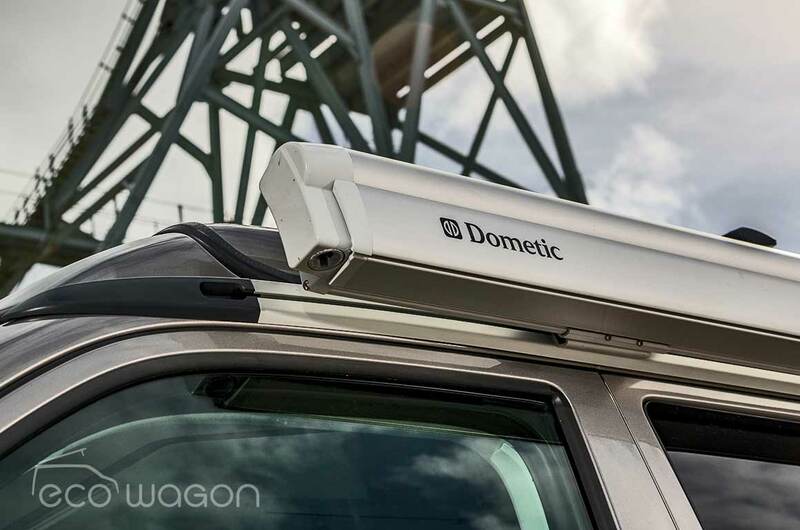 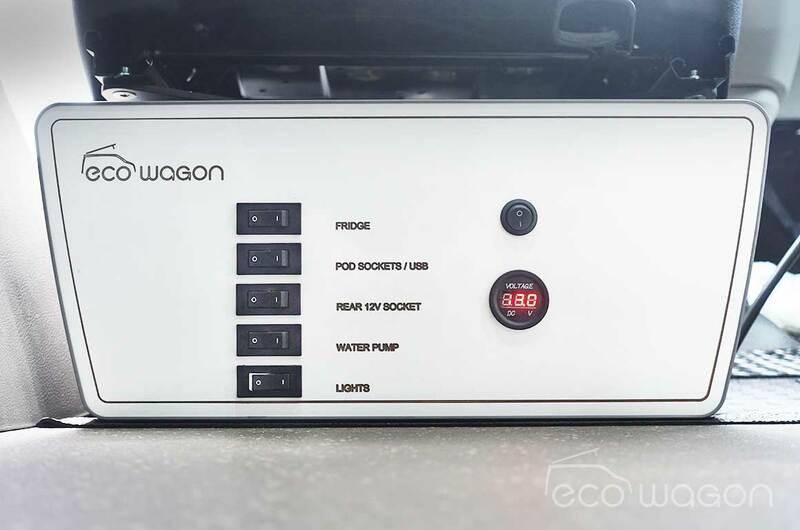 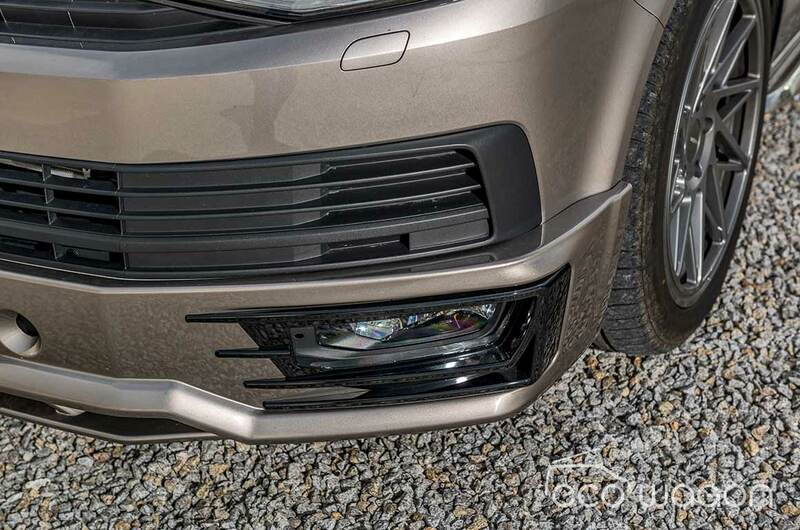 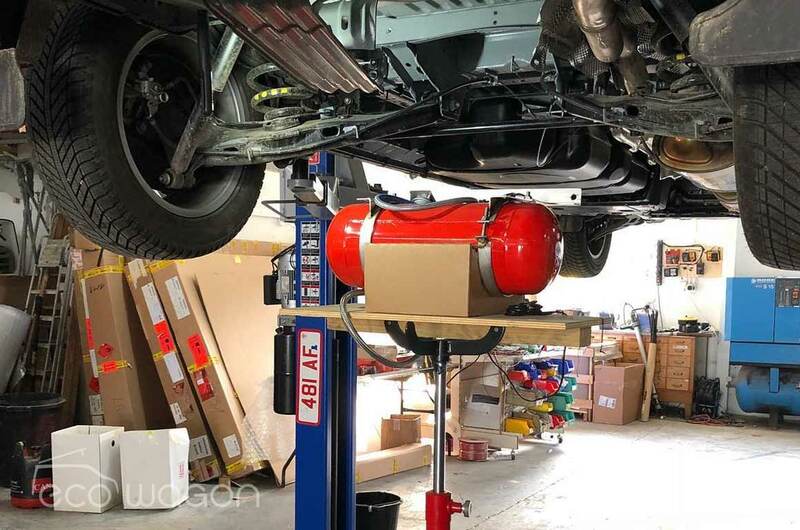 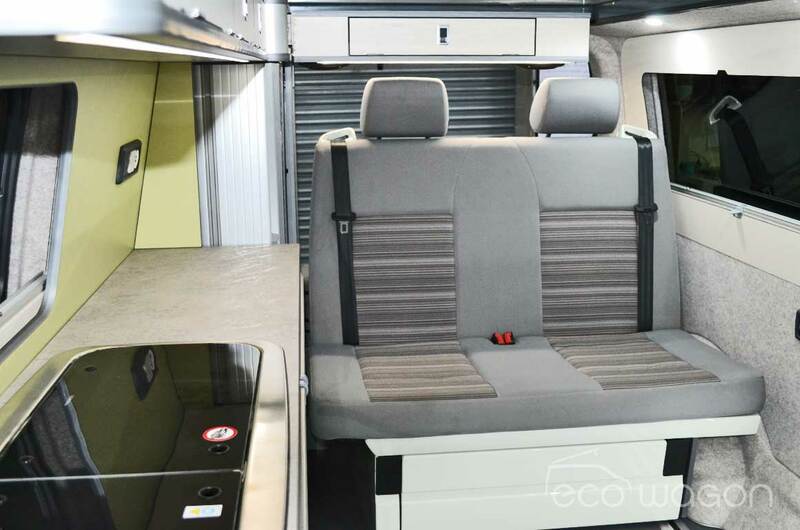 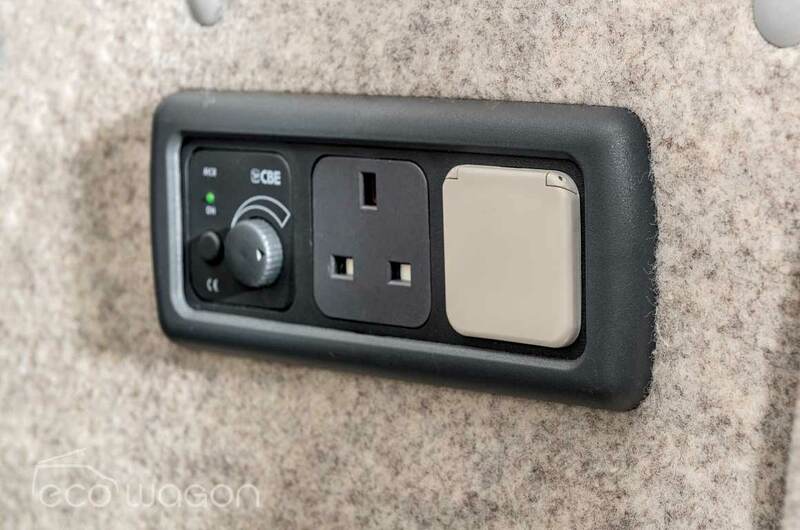 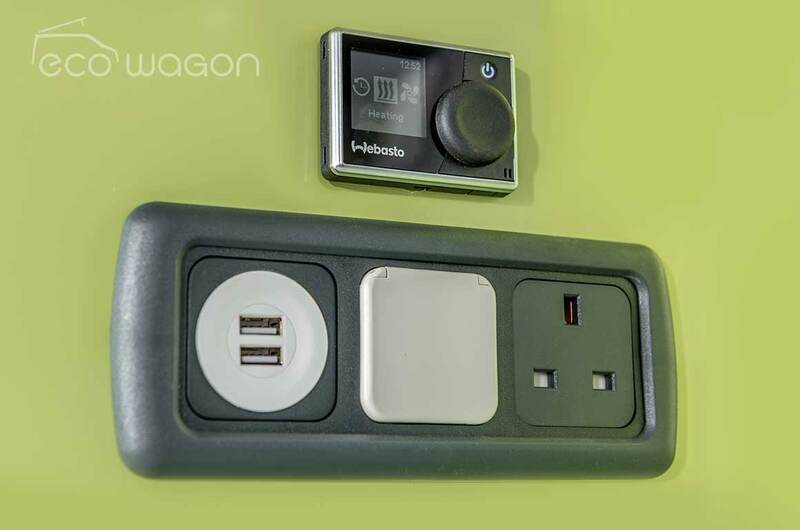 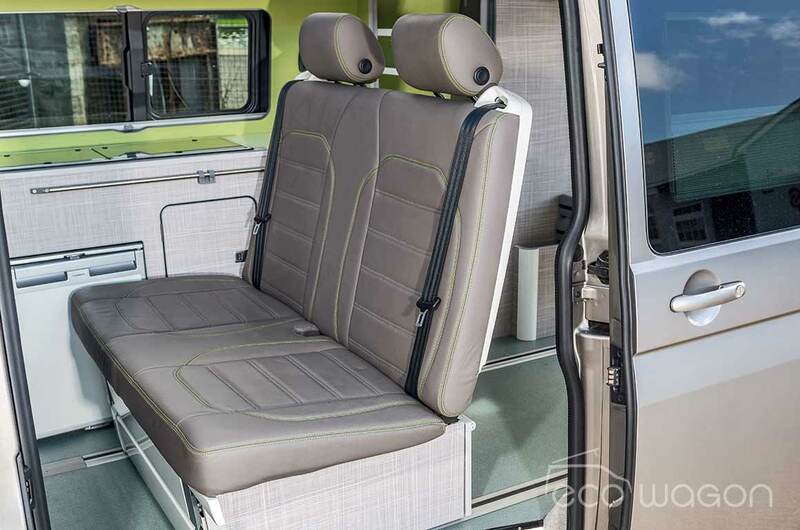 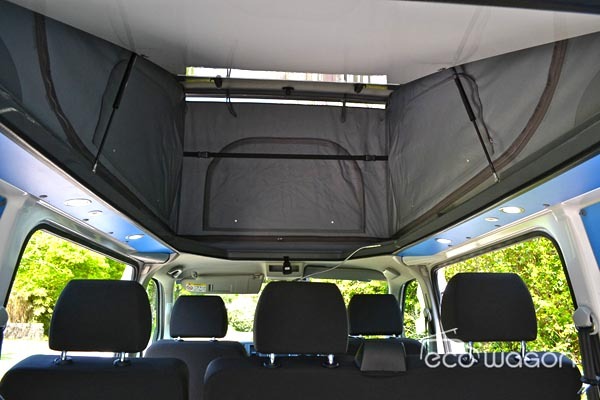 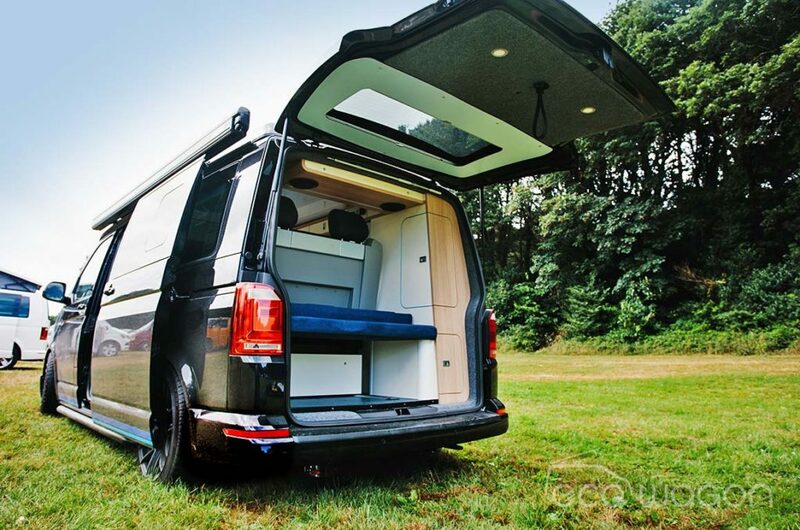 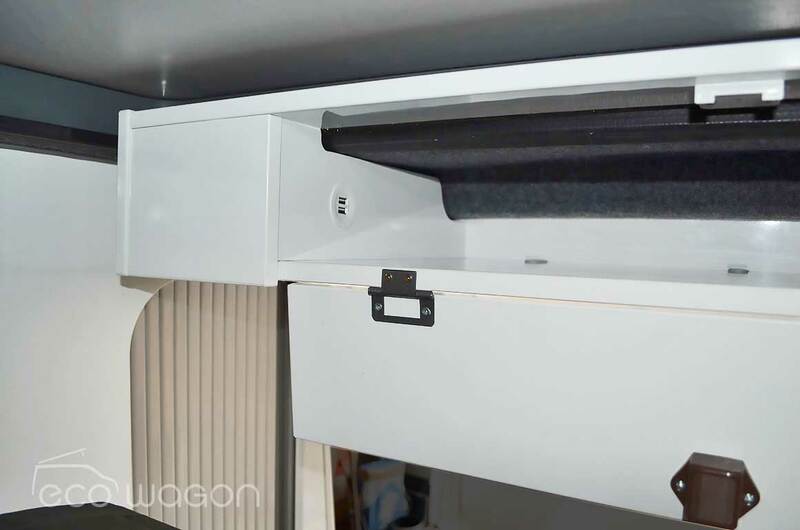 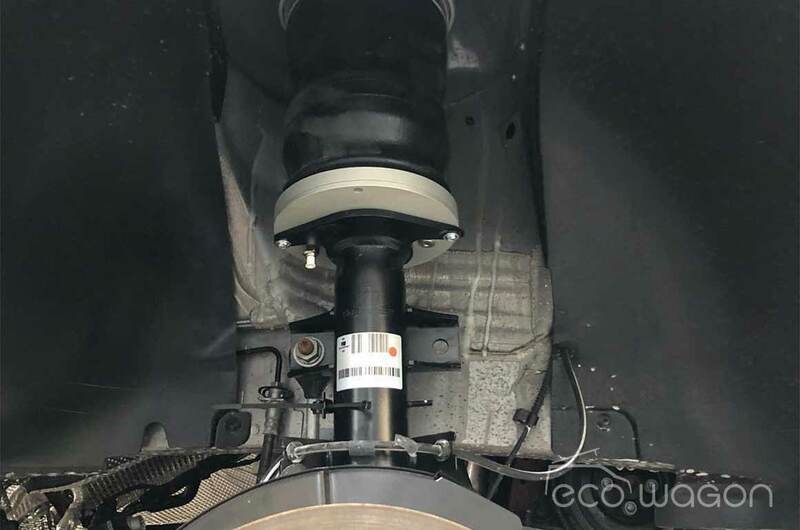 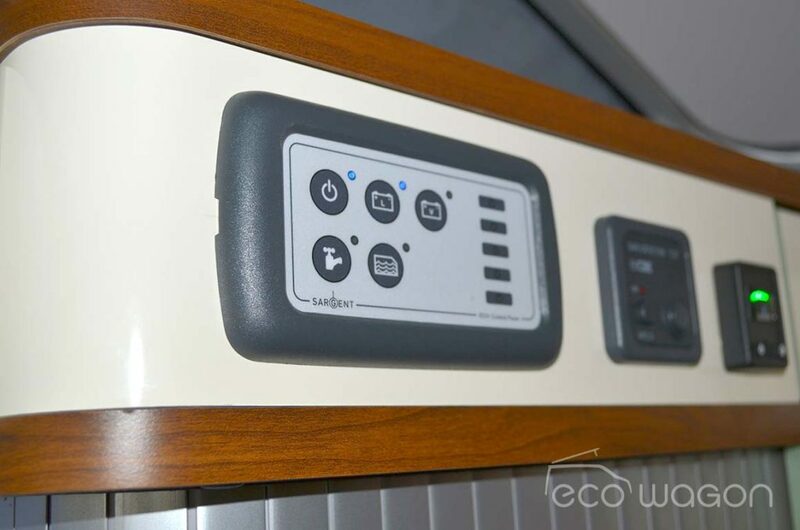 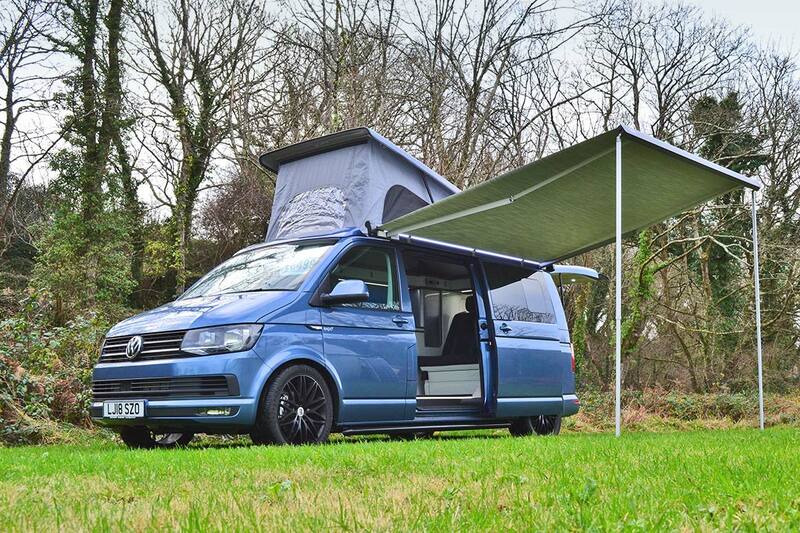 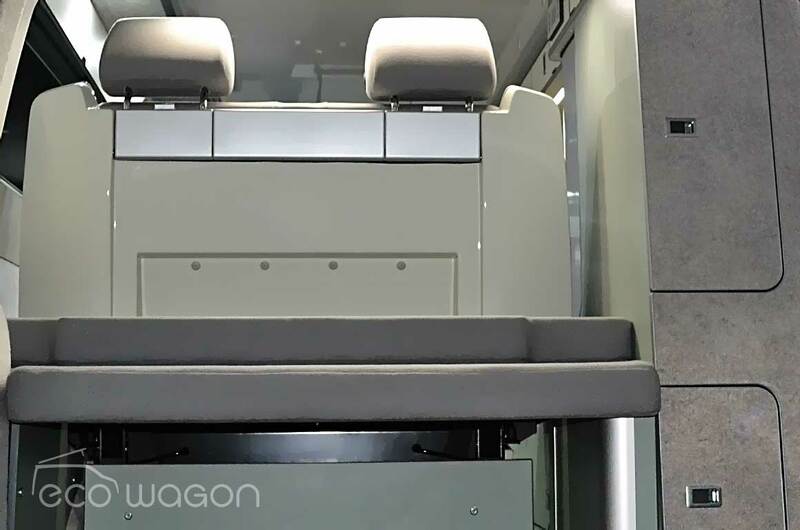 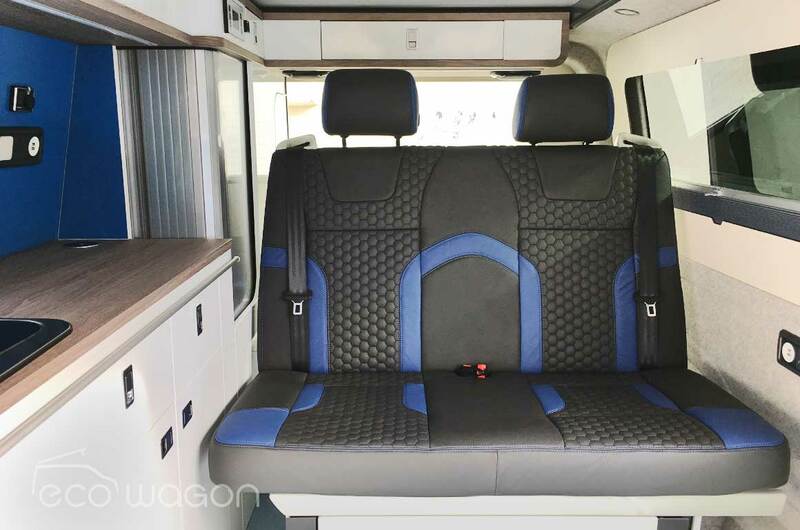 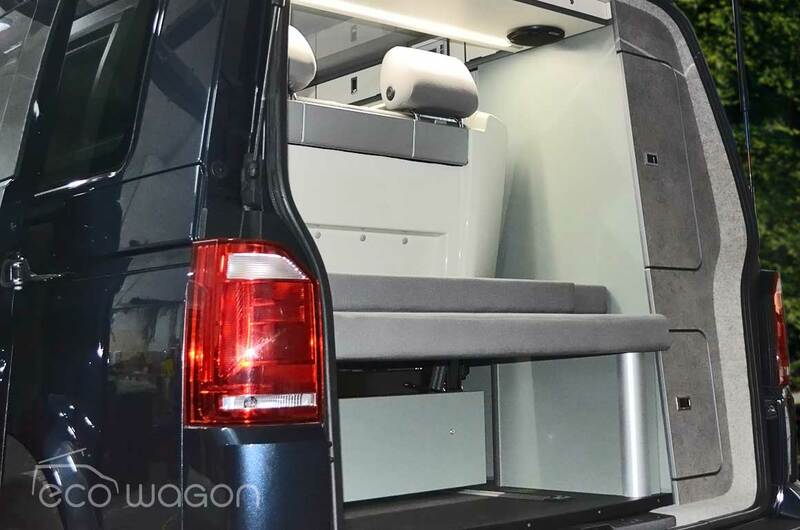 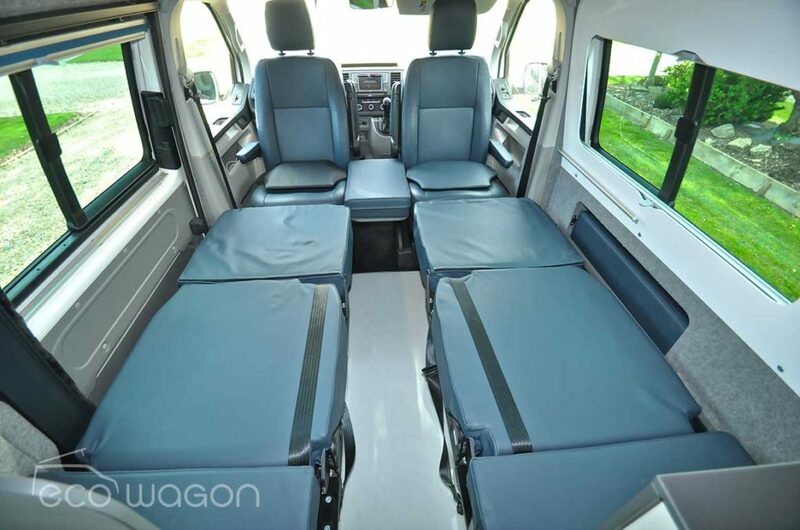 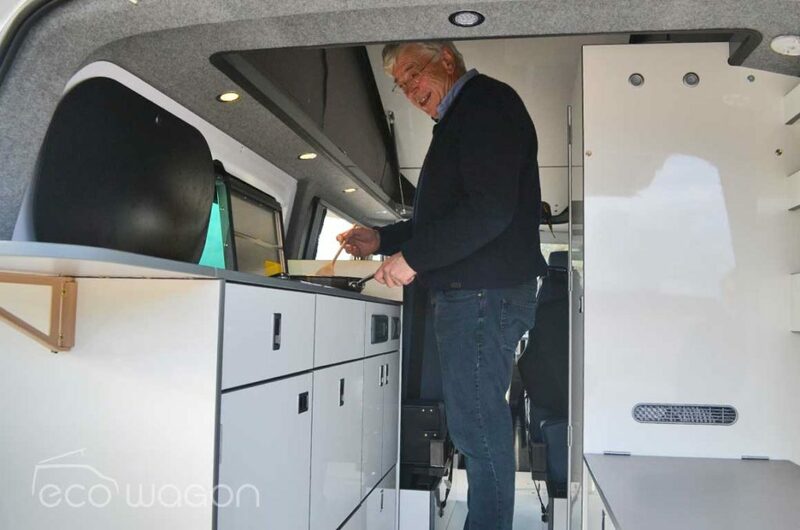 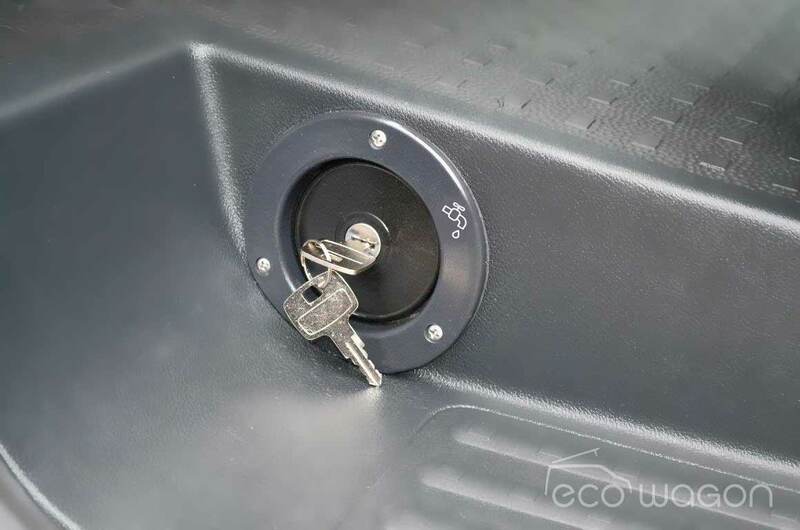 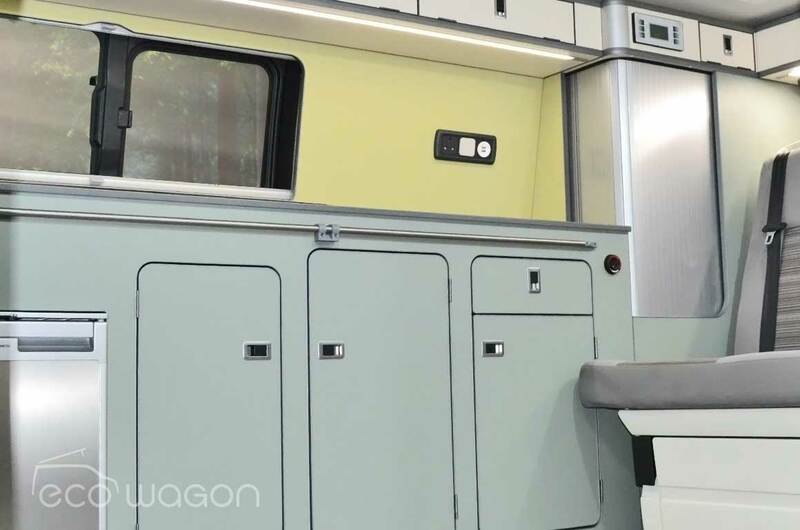 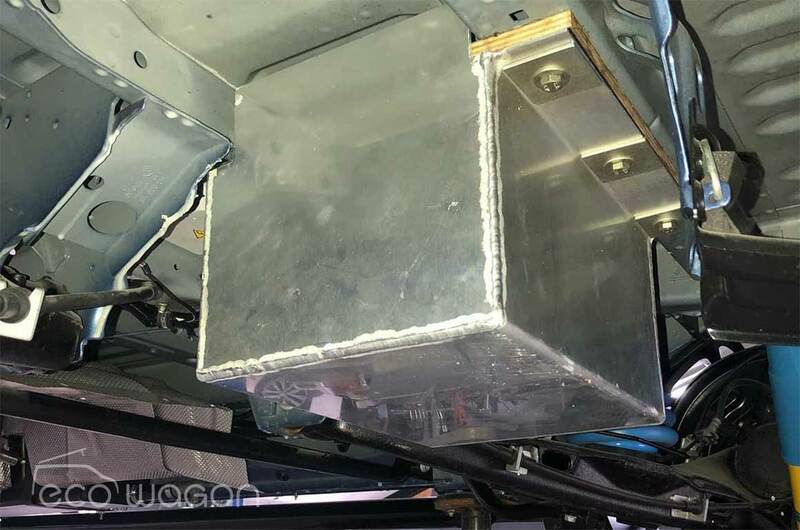 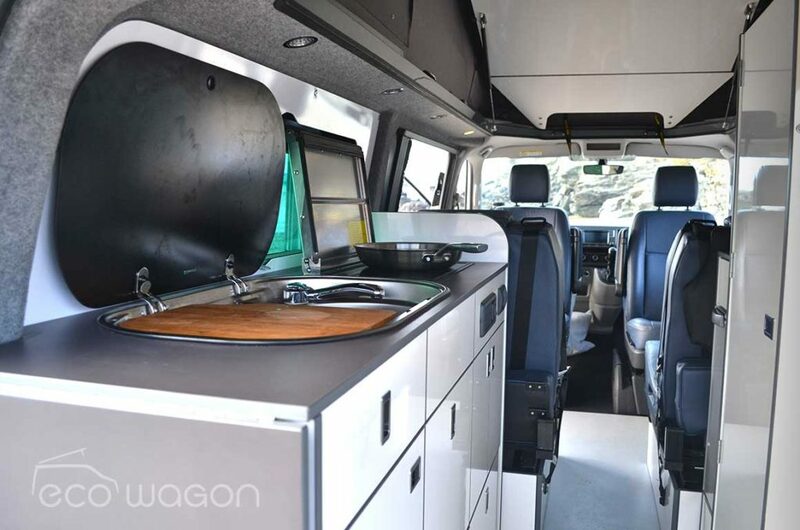 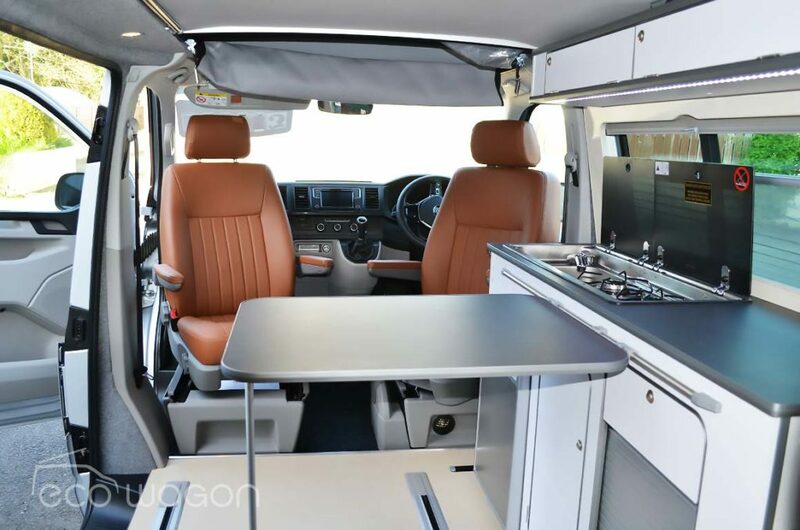 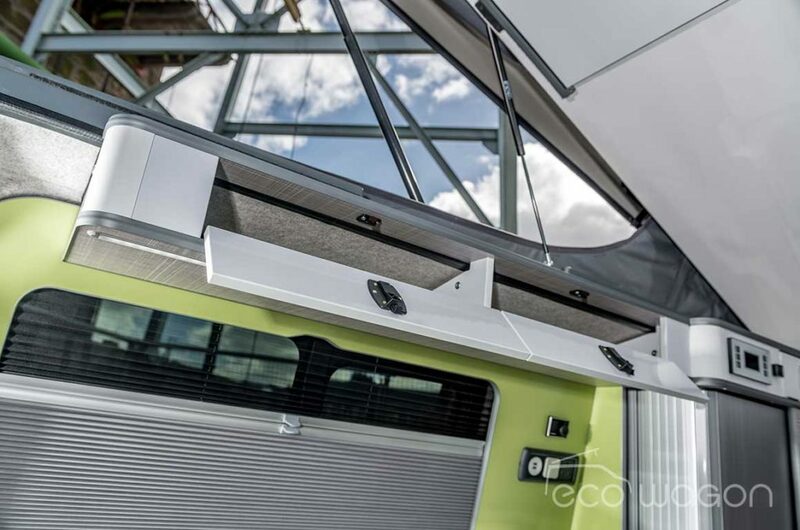 What type of kit is installed in Ecowagon VW T5 or T6 Transporter conversions? 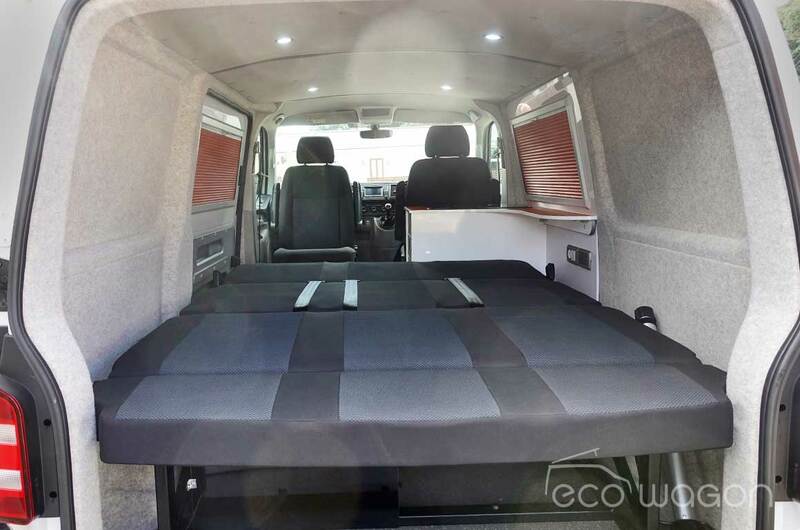 What help is available to choose my specification? 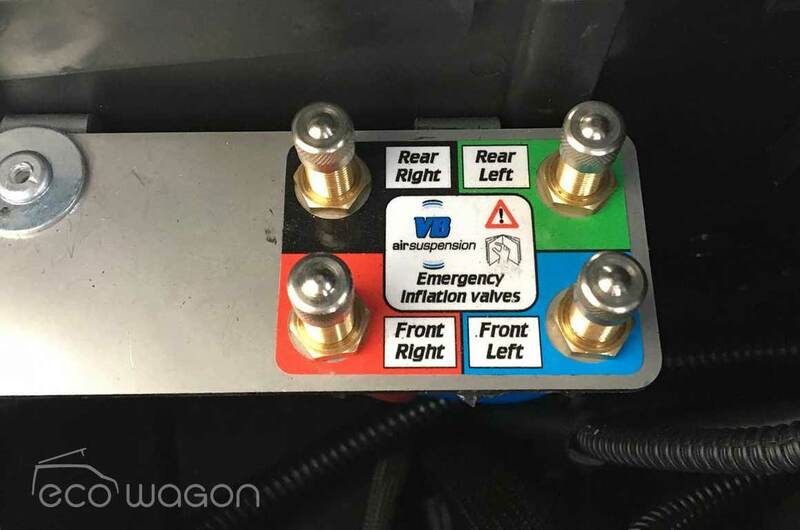 Is it easy to upgrade? How flexible is the kit selection in my conversion? 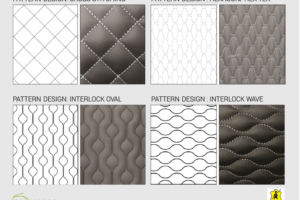 Check out the sections below, they will certainly help. 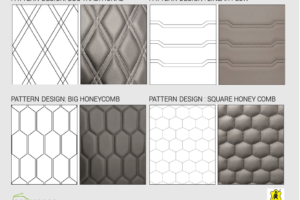 Some like it hot, some like it soft, others like it bold. 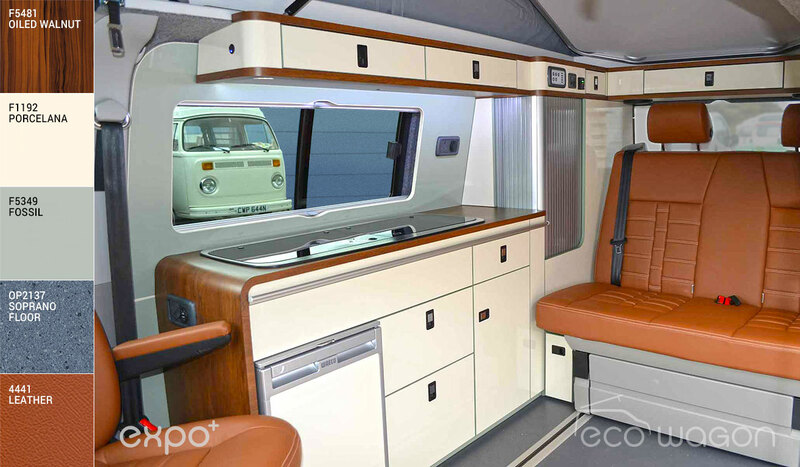 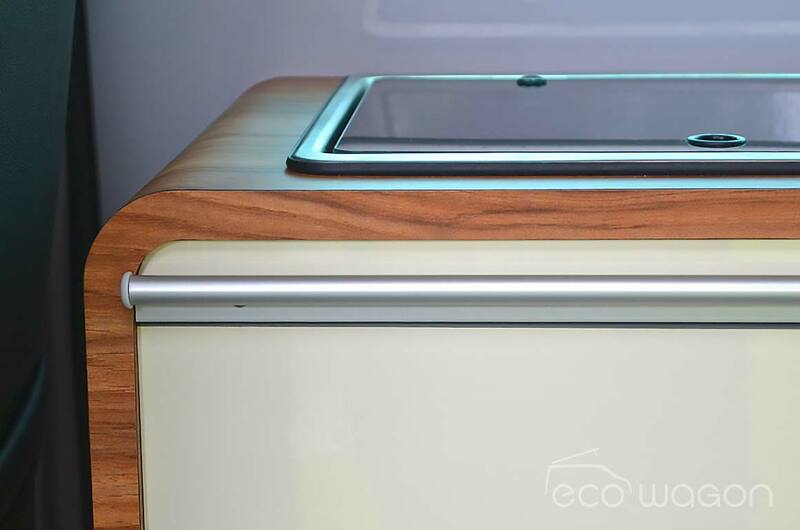 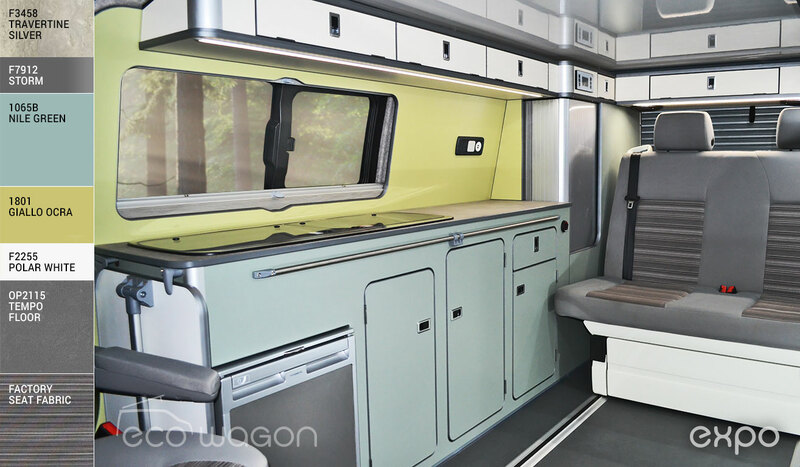 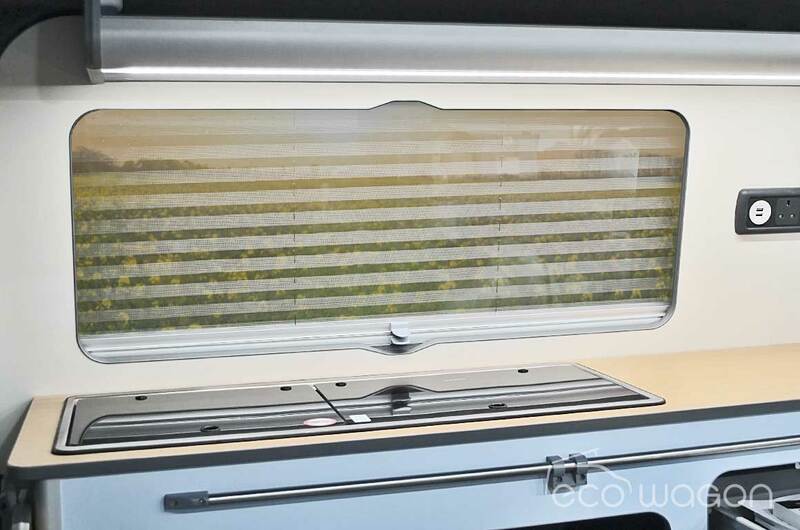 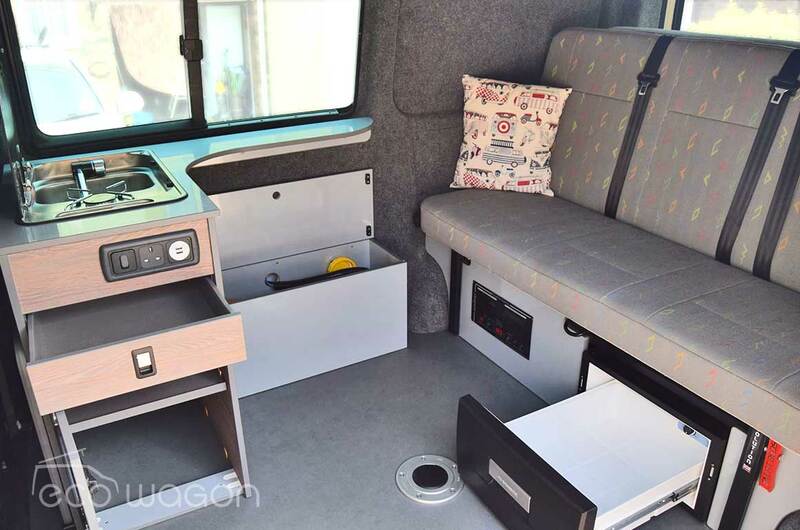 Illustrated below is a classic “warm hue” interior from an Ecowagon Expo Plus VW T6 conversion. 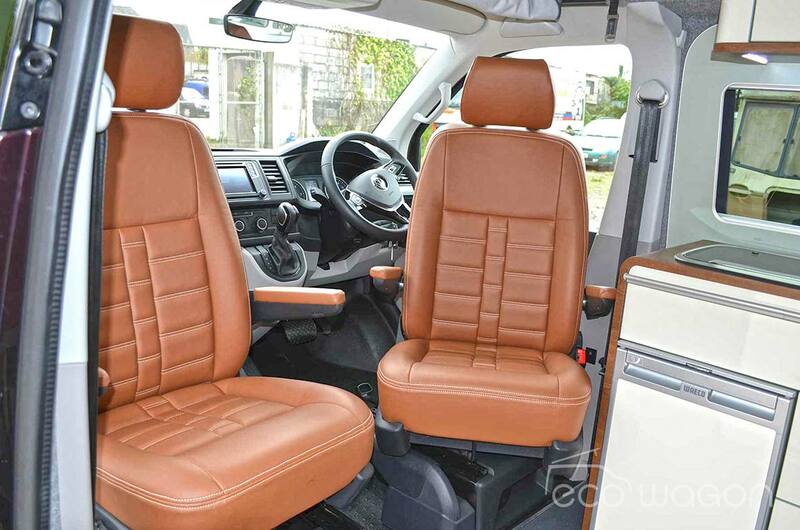 Creams, grey-greens, muted blue, warm tans and wood patterned laminate make for a calm campervan environment. 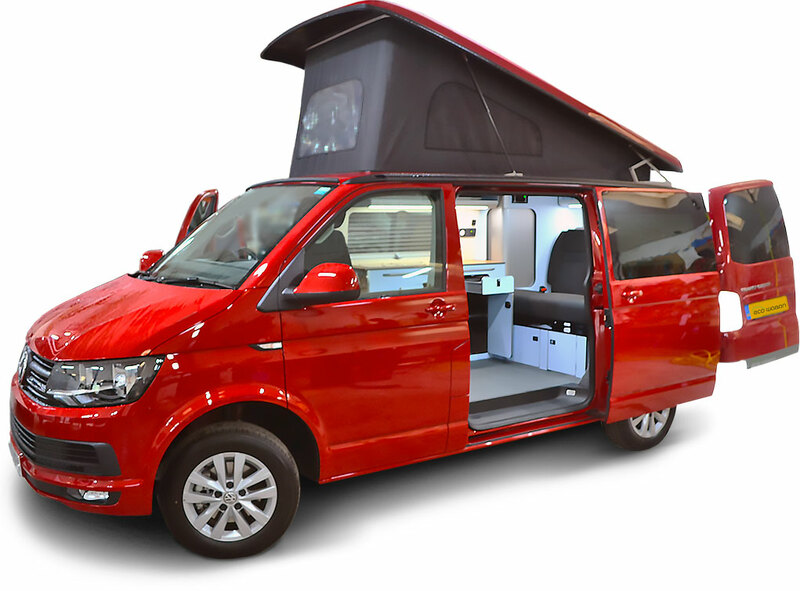 At first glance this VW T6 colour combination looks quite simple. 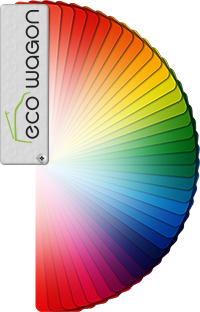 It’s actually quite a complex colour union which works really well. 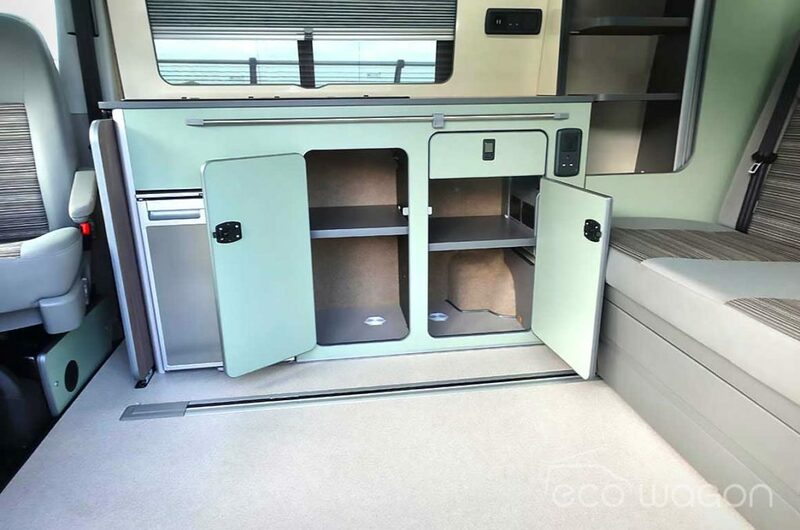 There are silvers, a softened limey green, clean white, muted light teal, travertine coloured worktop with bonded grey edging and the seats are original factory upholstery. 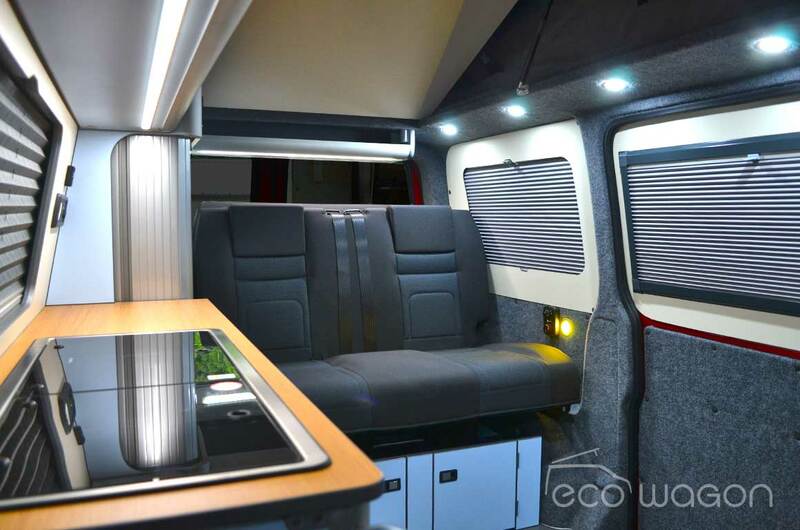 A classic and big applause to our client for having the vision to create this beauty. 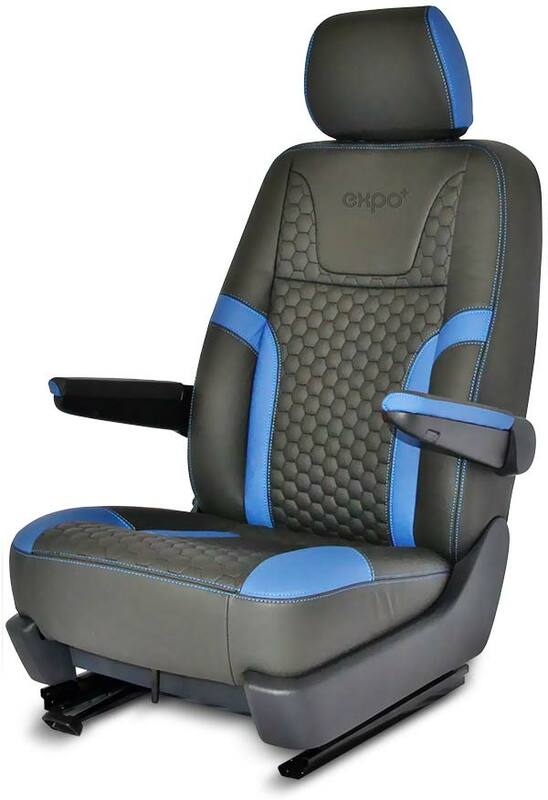 View the Expo conversion here. 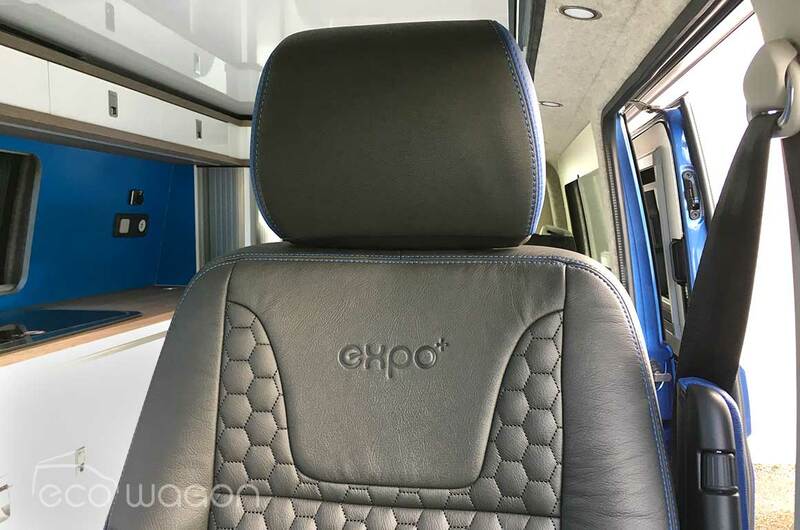 We find this Expo VW T6 interior calming and peaceful with the cream window surrounds and powder blue units. Classic greys compliment the more dominant colours and offer a contemporary touch. 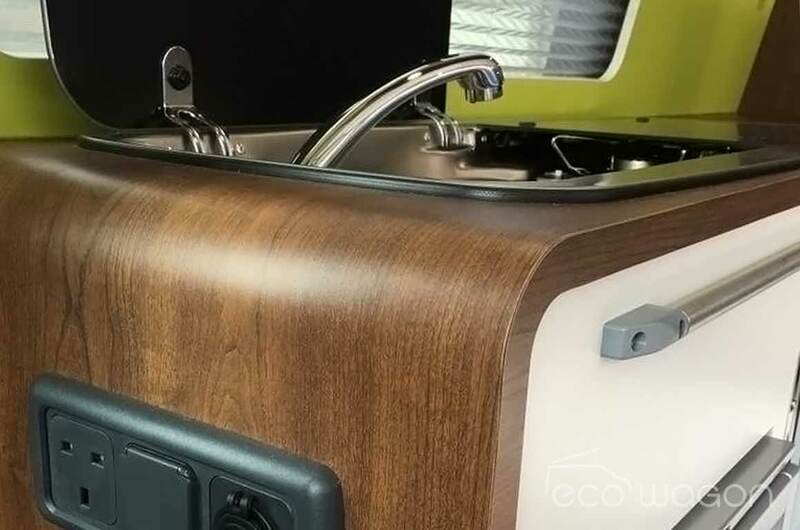 A vast proportion of our customers choose a wooden coloured laminate for the worktop – of course you don’t have to – you can choose from one of 936 colours, textures including stone, wood and patterned laminates (see more below). 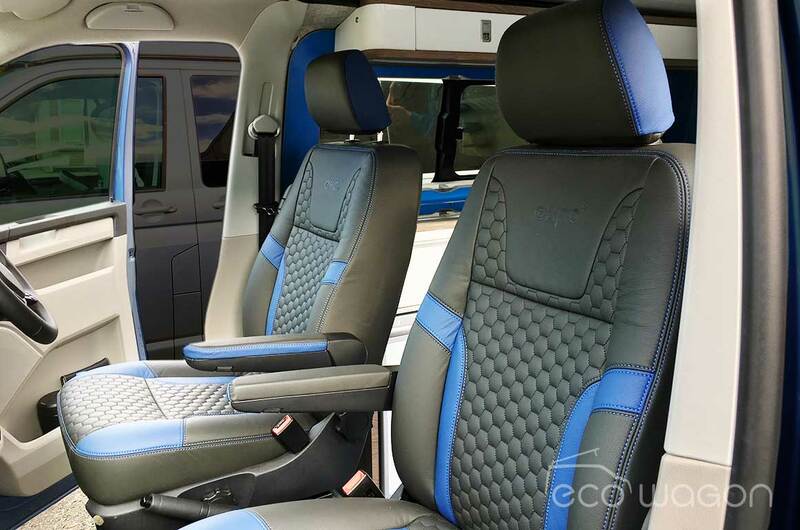 If you choose leather upholstery as an optional upgrade then you have an amazing choice of colours and patterns. 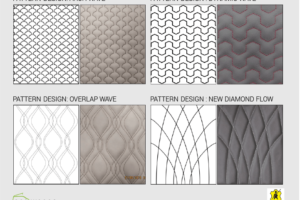 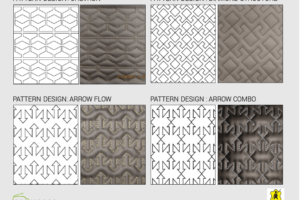 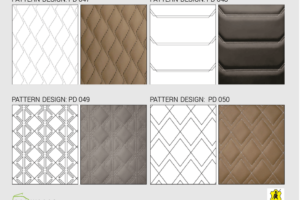 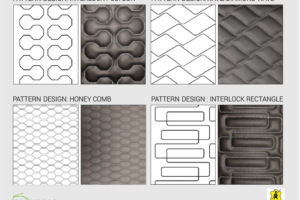 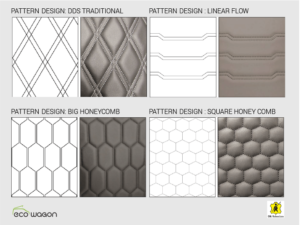 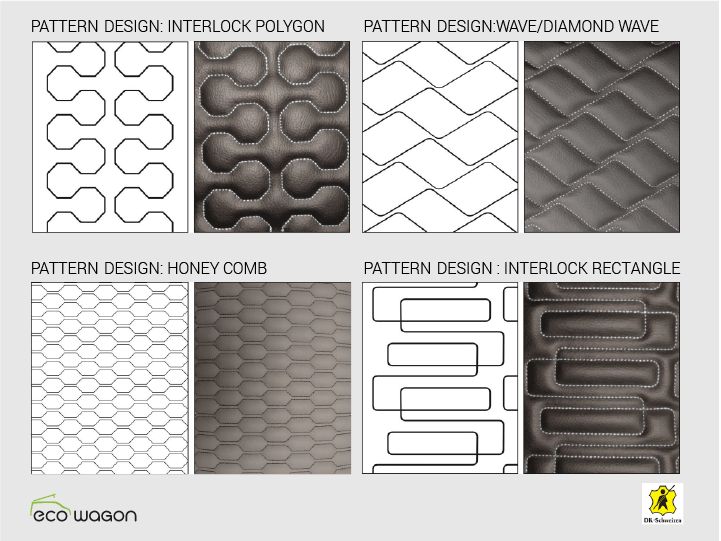 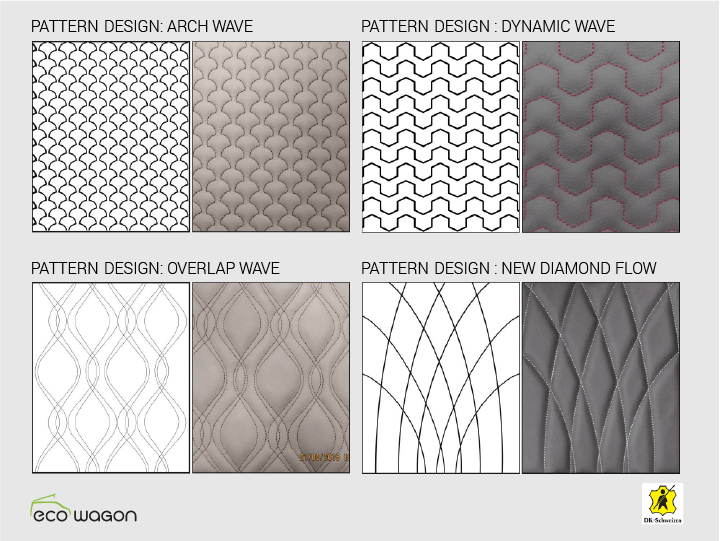 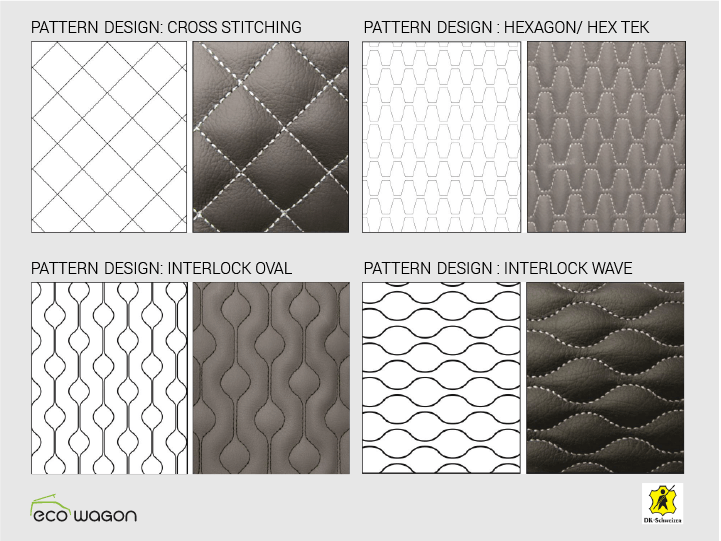 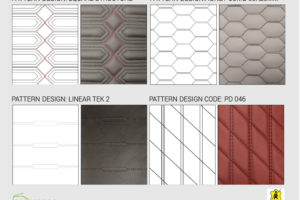 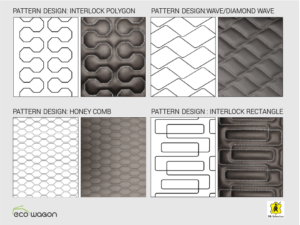 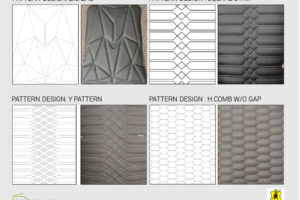 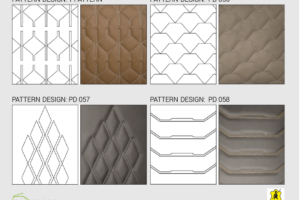 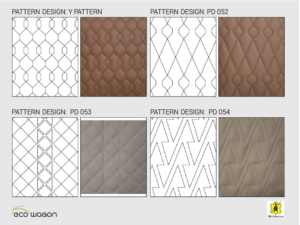 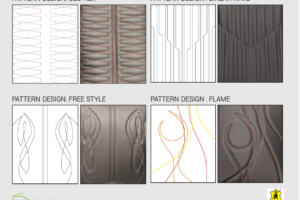 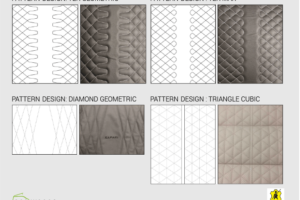 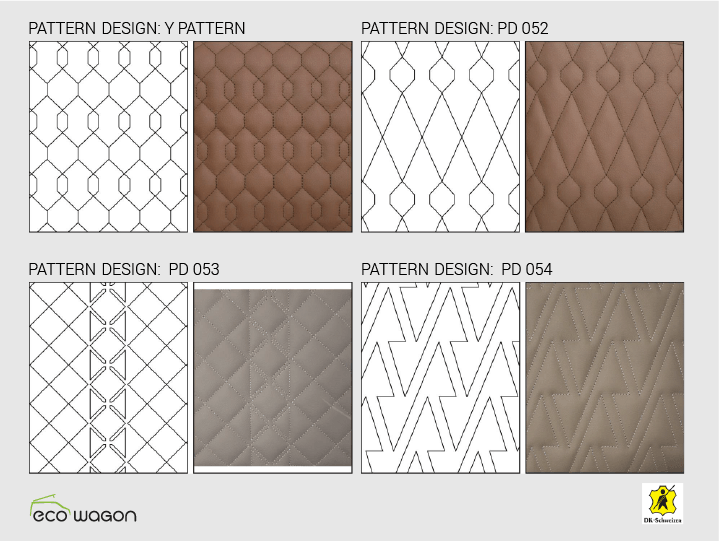 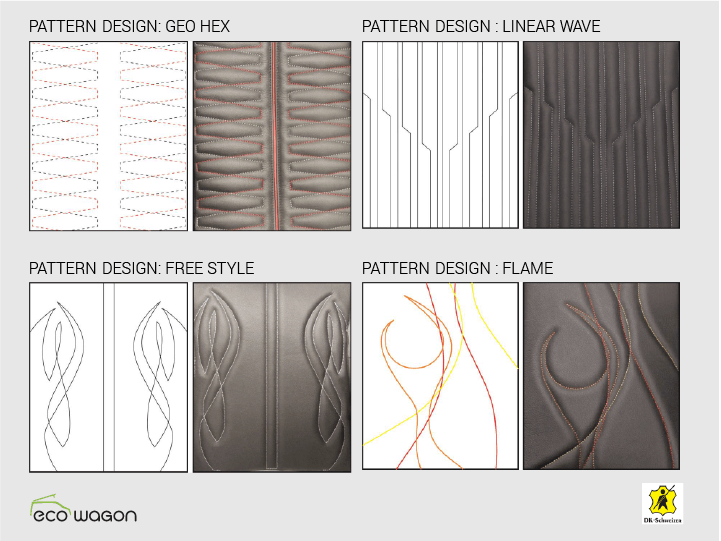 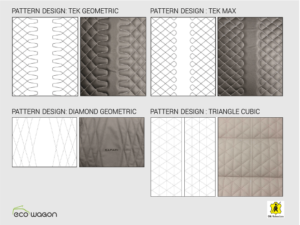 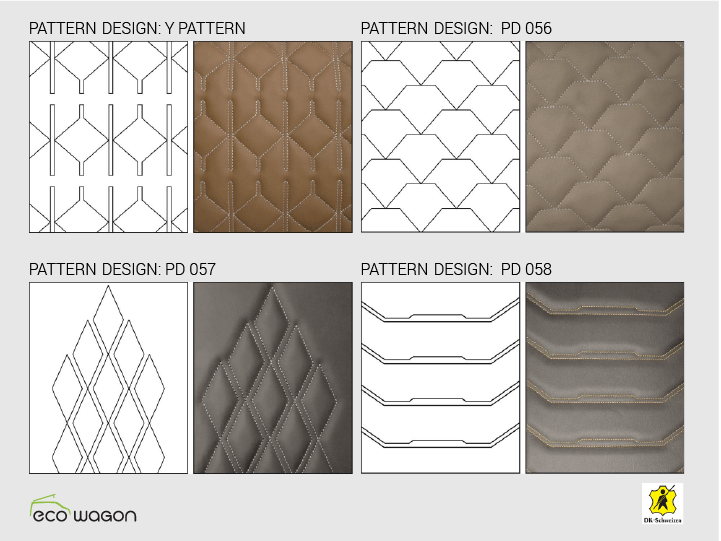 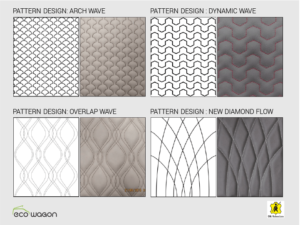 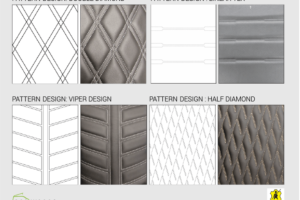 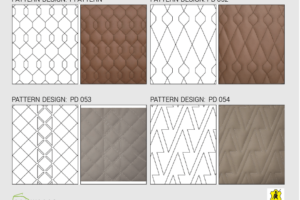 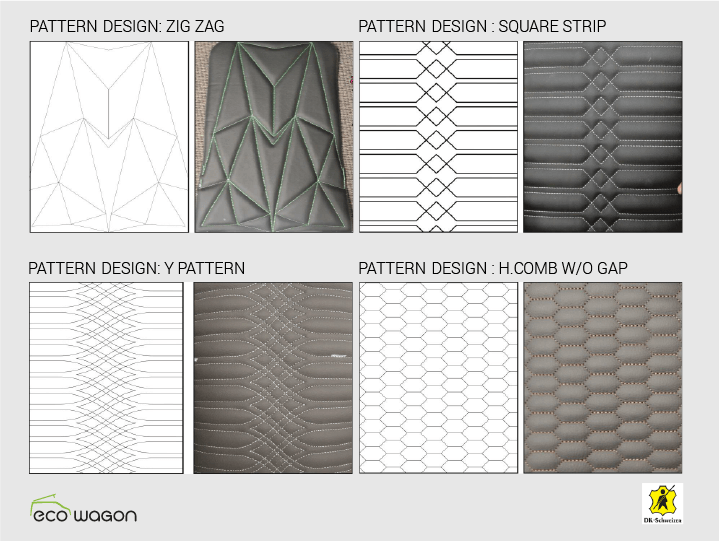 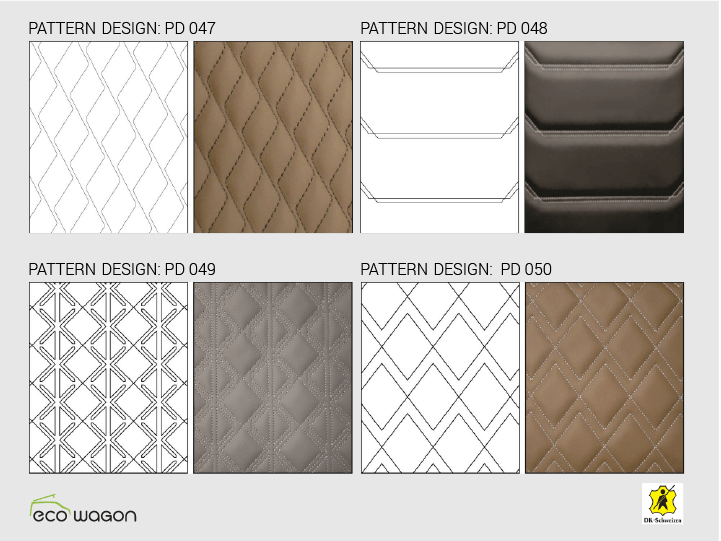 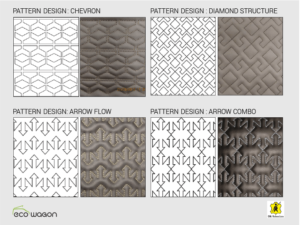 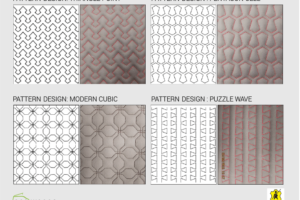 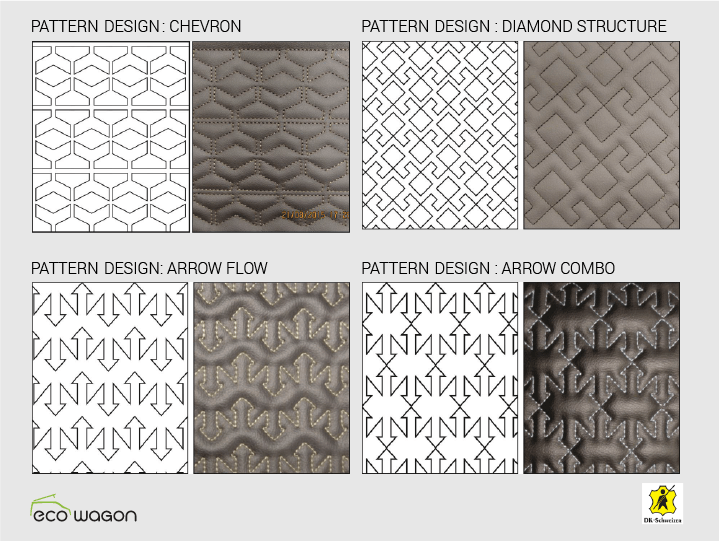 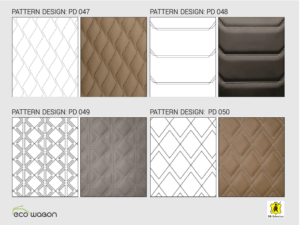 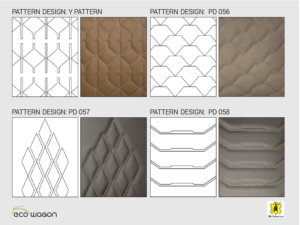 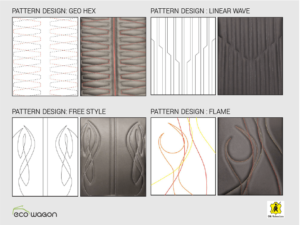 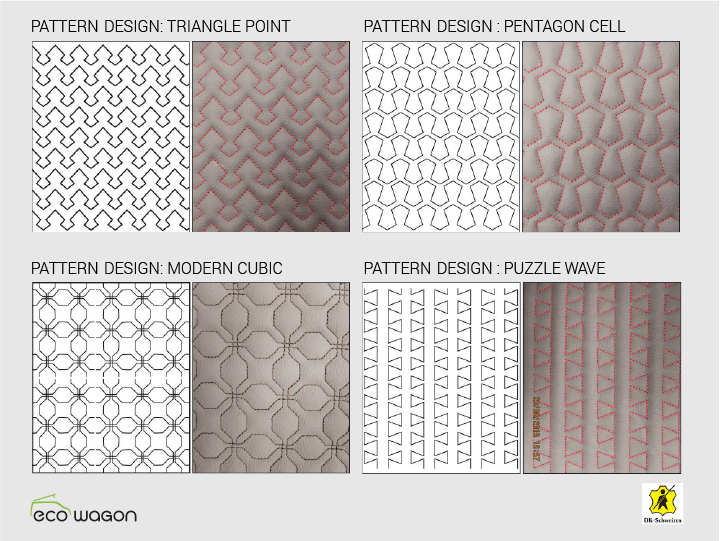 Click on the swatch gallery below to view leather colourways and stitching / quilting options. 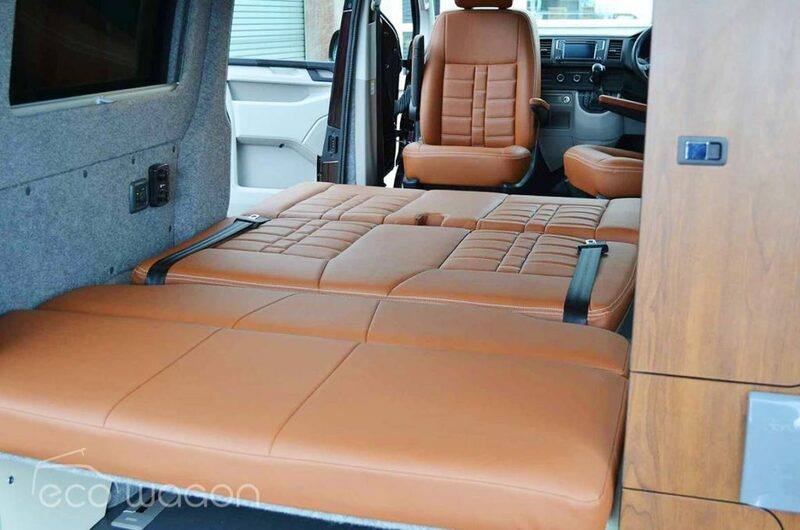 Our customers tell us that they are amazed with the spec we offer on our conversions. 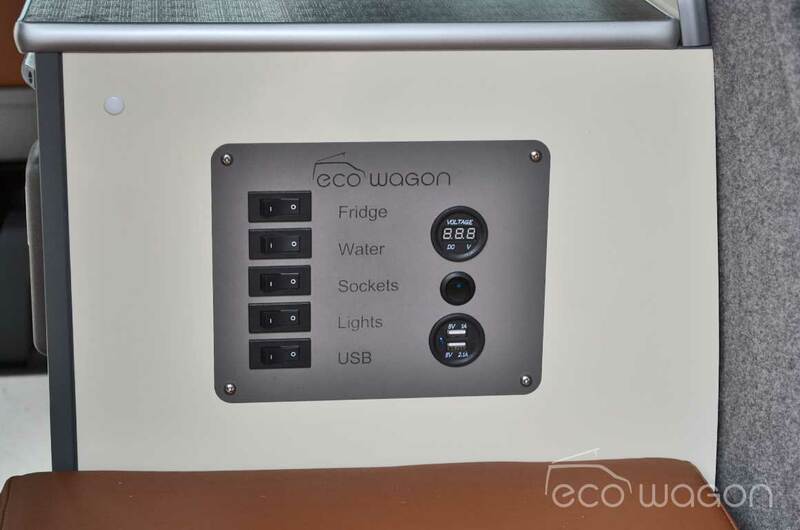 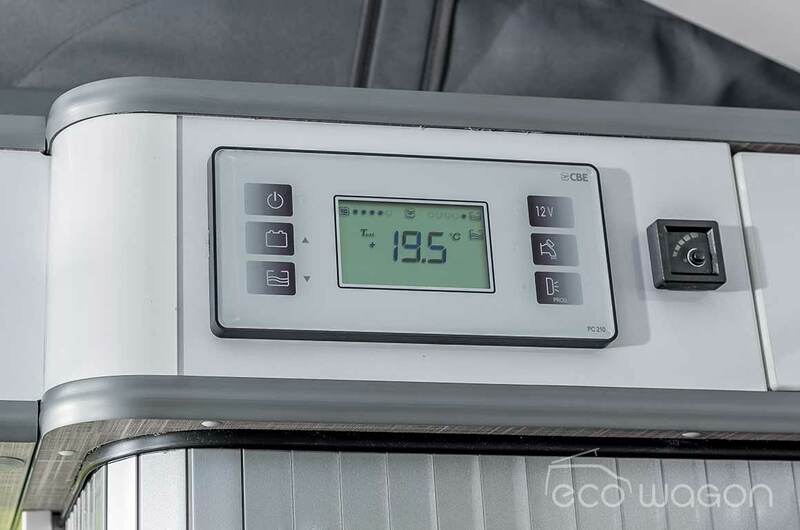 All our kit is of the highest quality and we even manufacture our own Ecowagon warrantied equipment, for example custom blinds, thermal cutout switch panels and exquisite precision edgebanded storage units. 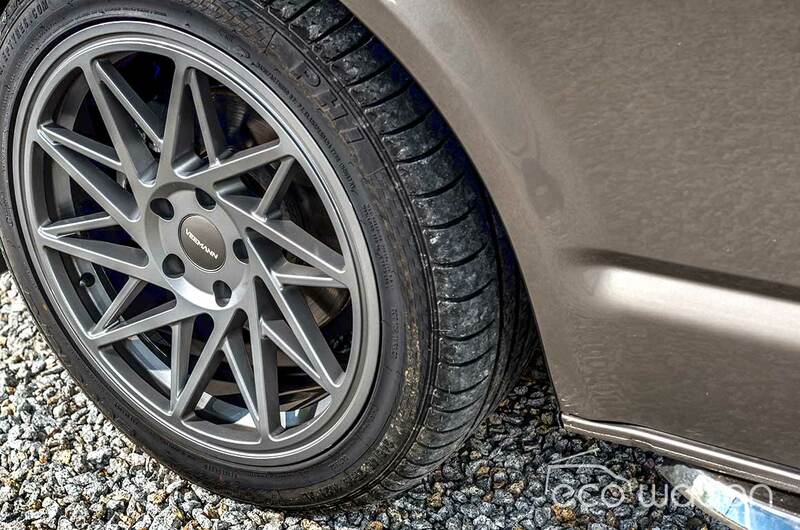 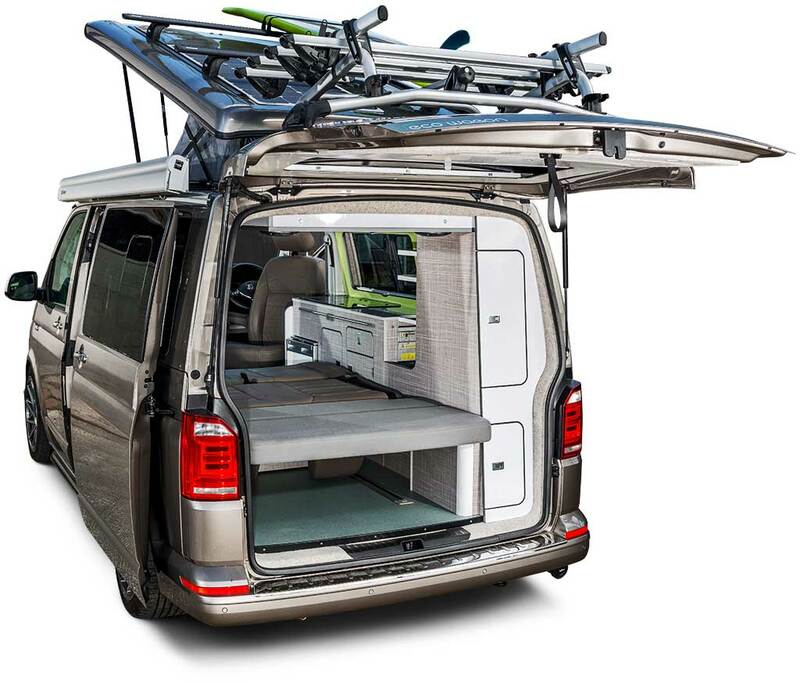 Depending on the conversion model you will expect equipment from Alpine, CBE, CTEK, Dometic, Gaslow, Reimo, RIB, SCA, Smartbed, Thule, Volkswagen, Webasto and the list goes on (we won’t bore you with an exhaustive list). 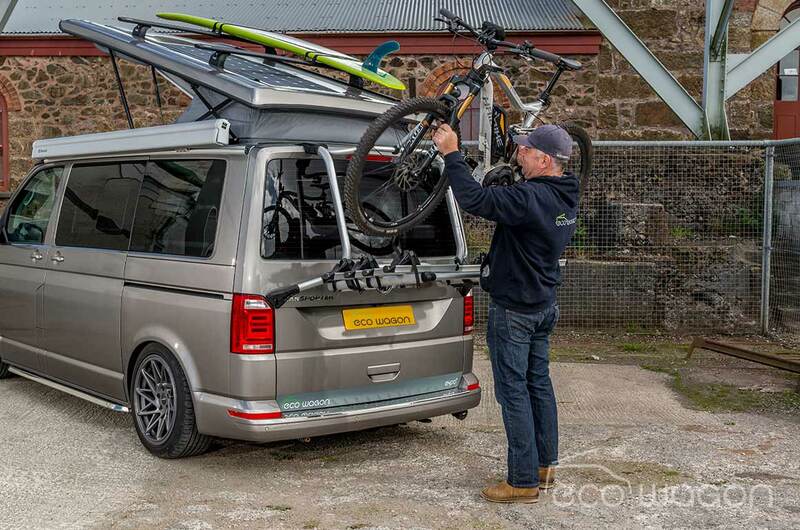 Suffice to say we fit components that will last and stand up to the rigours of your adventures. 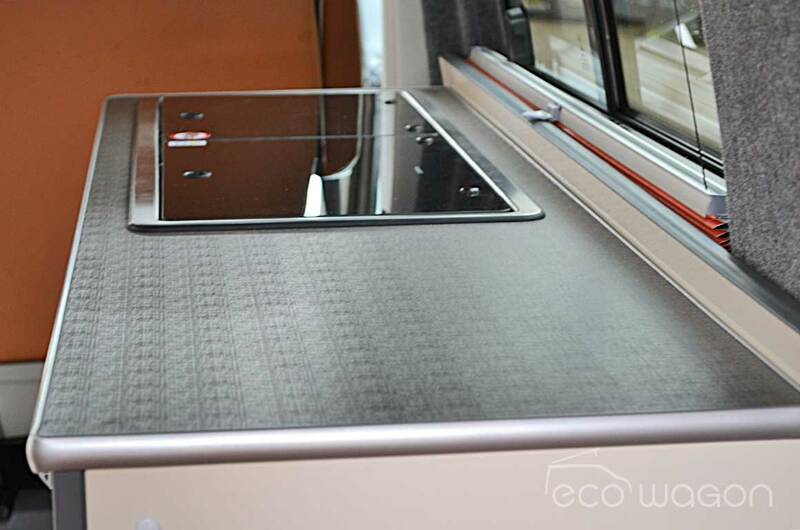 Our workmanship and kit is covered by the Ecowagon three year warranty. 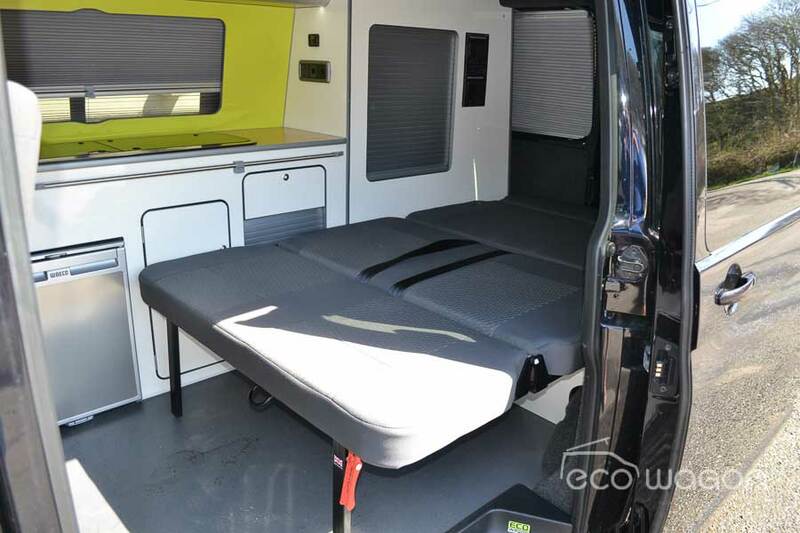 For the majority of our conversions we install Smartbed Rock n Roll beds. 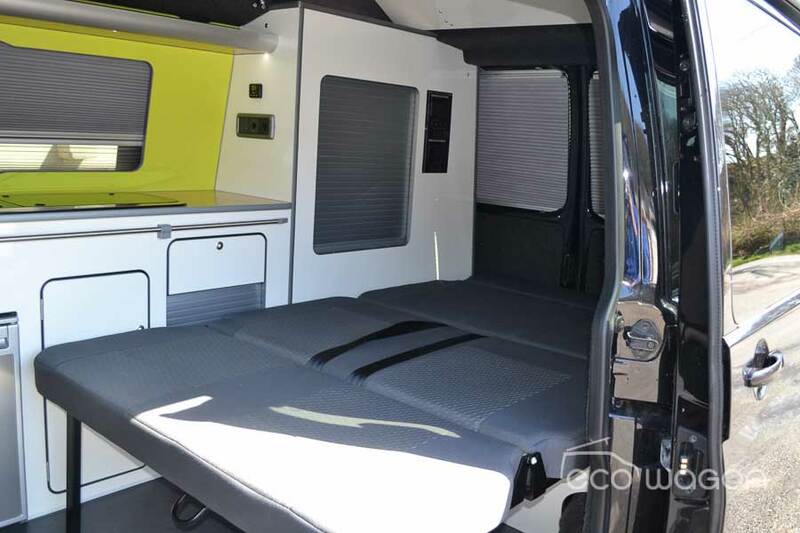 They come with a range of market leading features including: ease of use operating system, reclining mechanism, Evolux upholstery, fully powder coated frame, generous under bed storage space, optional stowable seat belts and head restraints. 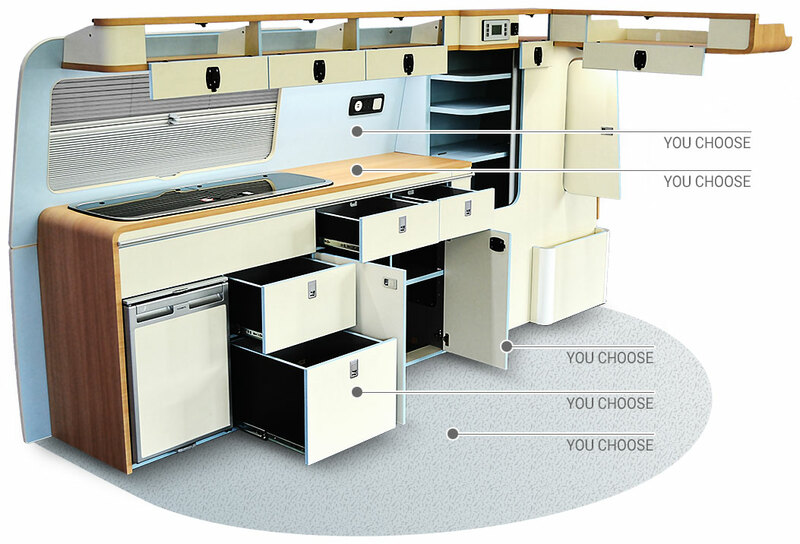 We offer this system because it really works and has long term proven reliability and comfort. 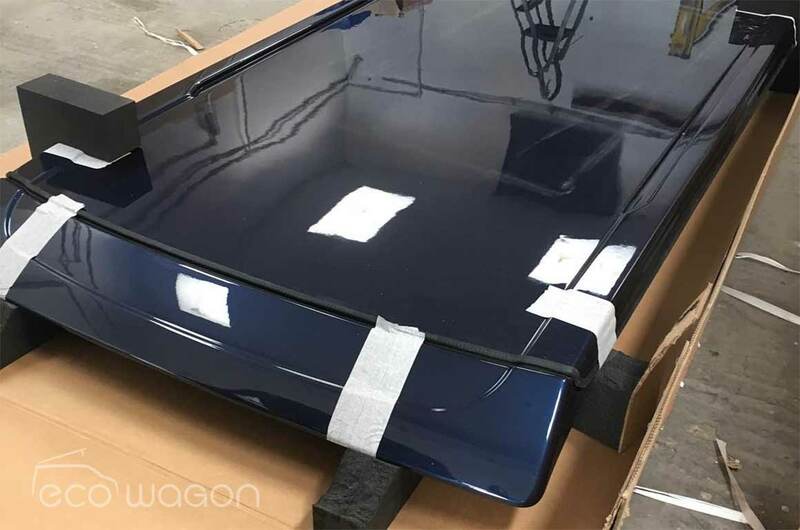 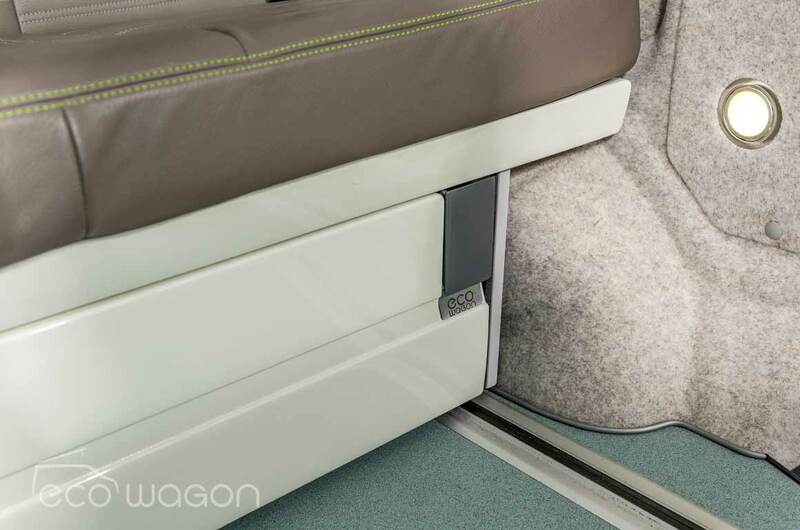 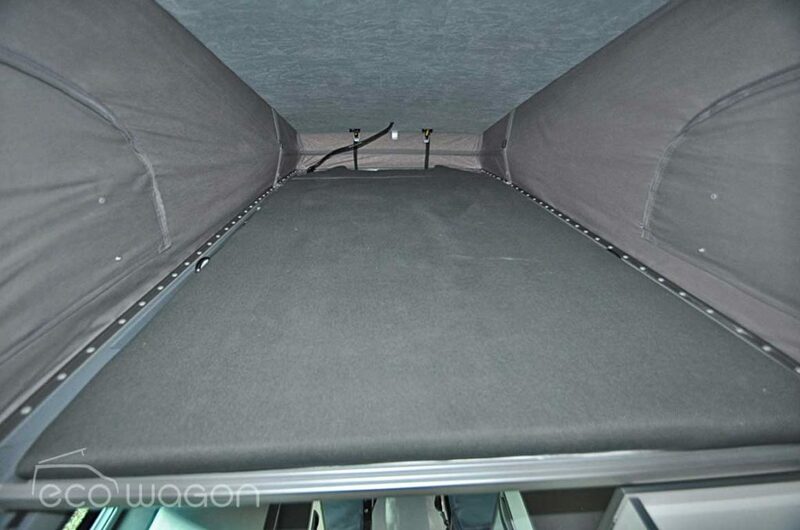 Some customers choose a VW California rail bed. 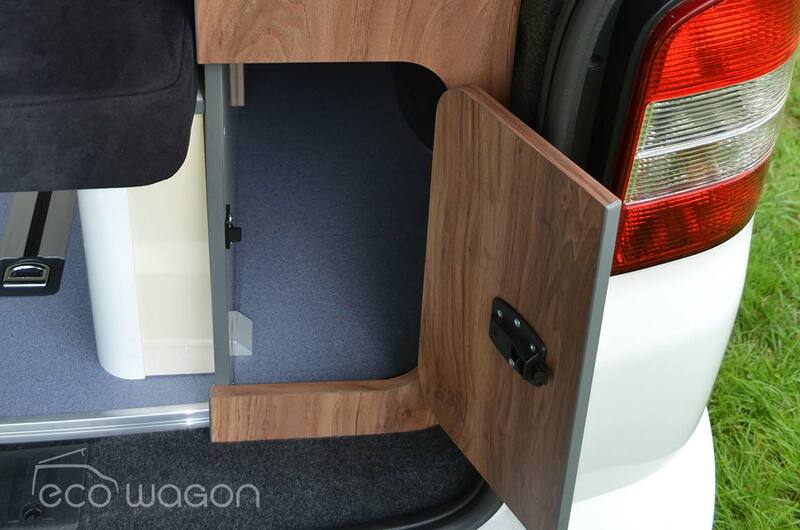 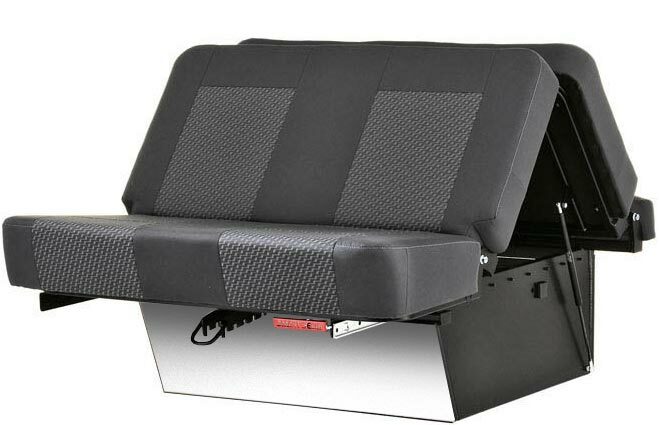 This option is extremely versatile including an under seat locker. 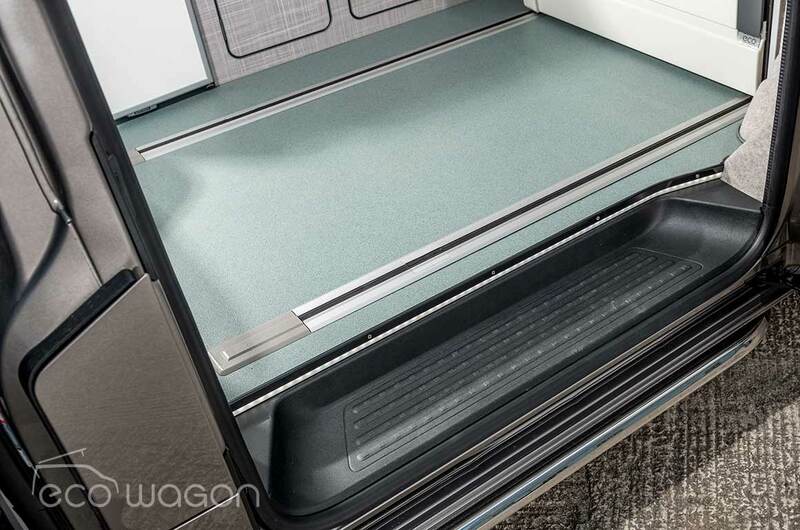 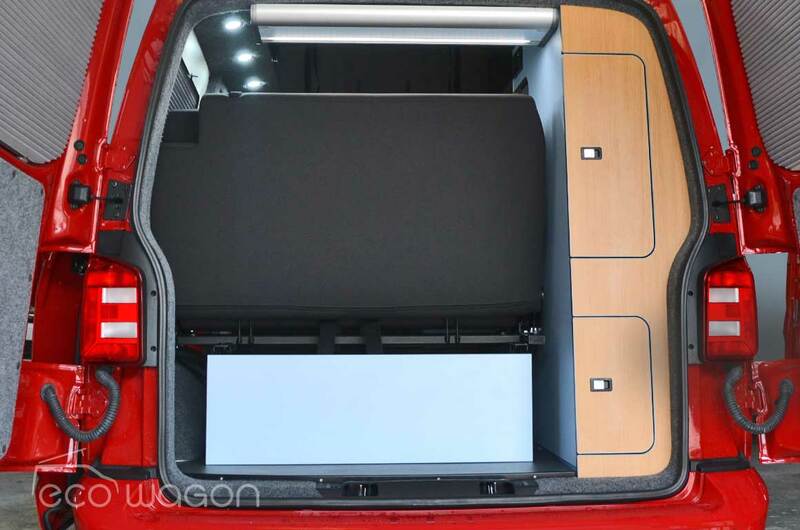 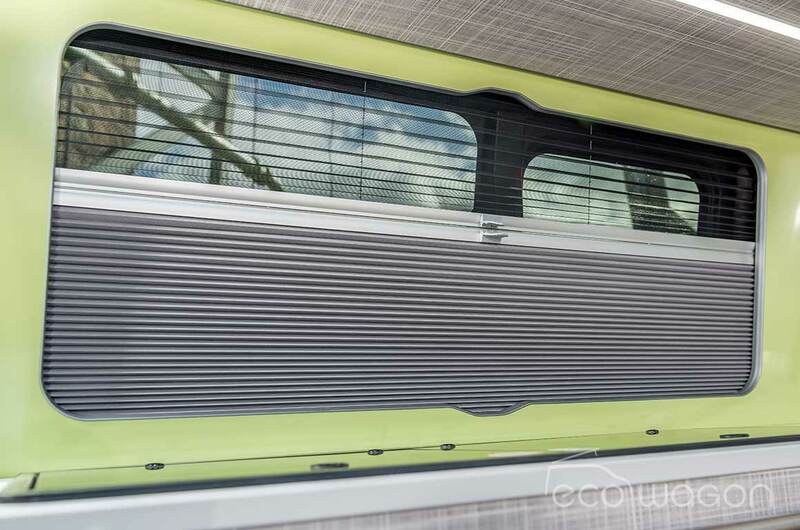 The sliding action frees up massive amounts of space in the rear of your VW Transporter conversion. 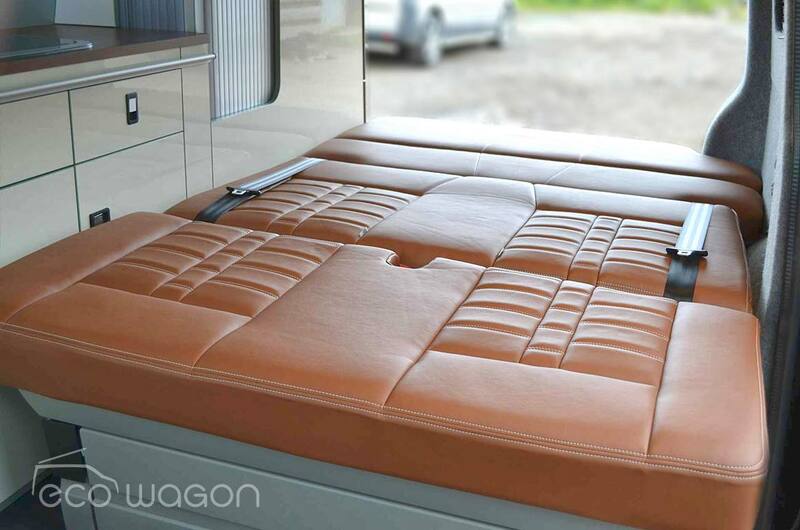 As an option all seat beds can be reupholstered in leather or fabric from our wide choice. 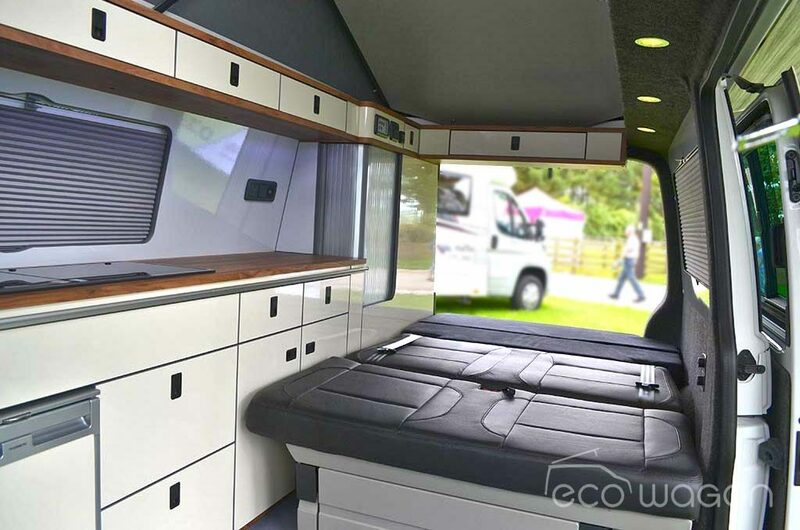 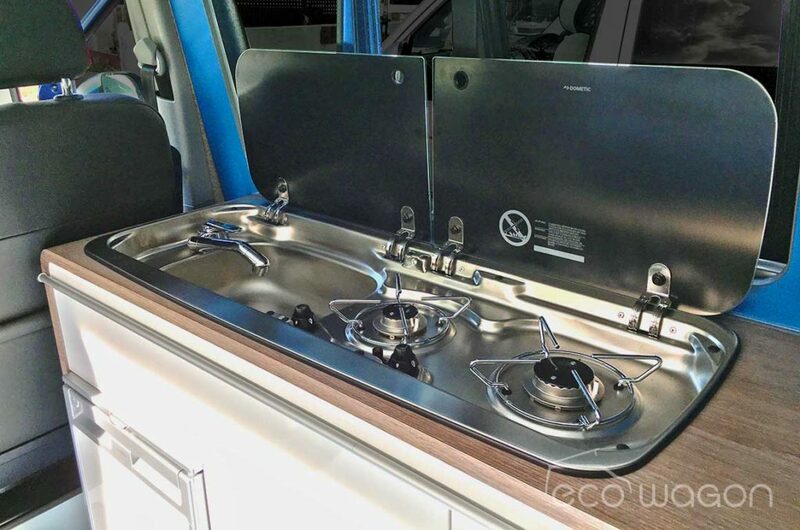 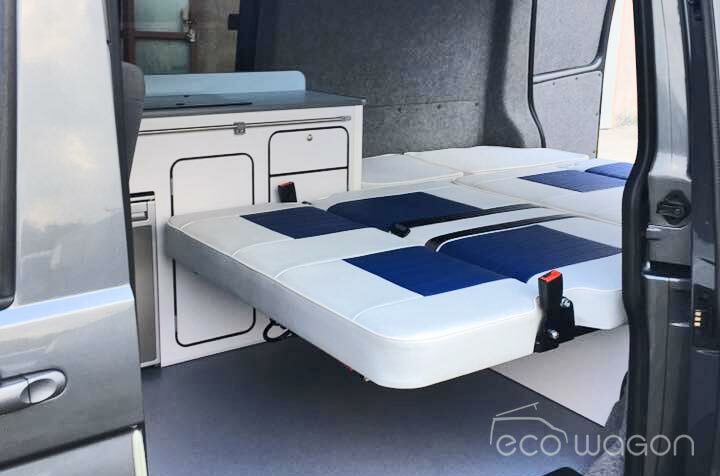 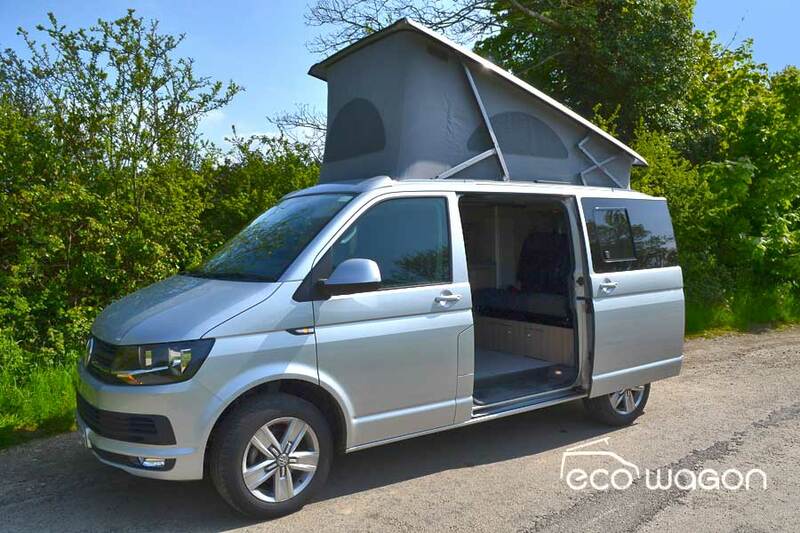 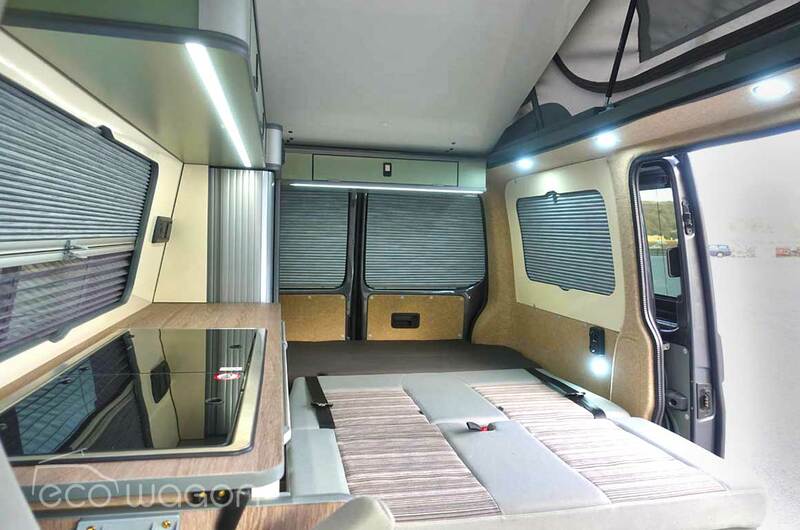 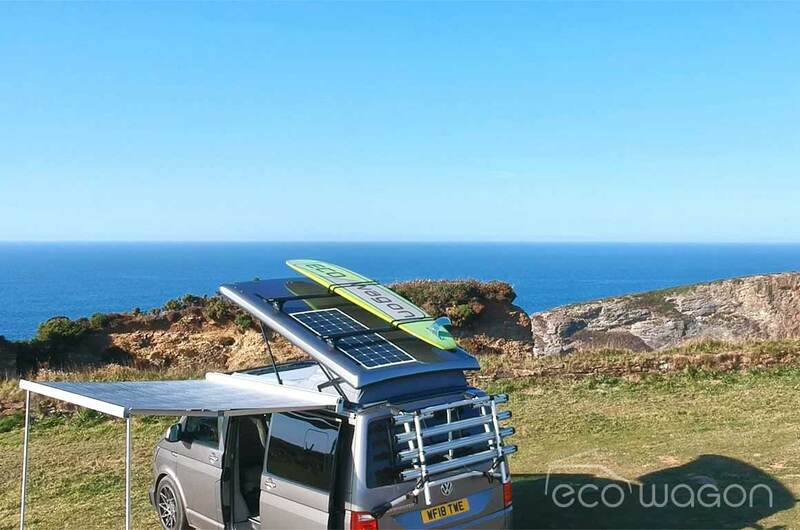 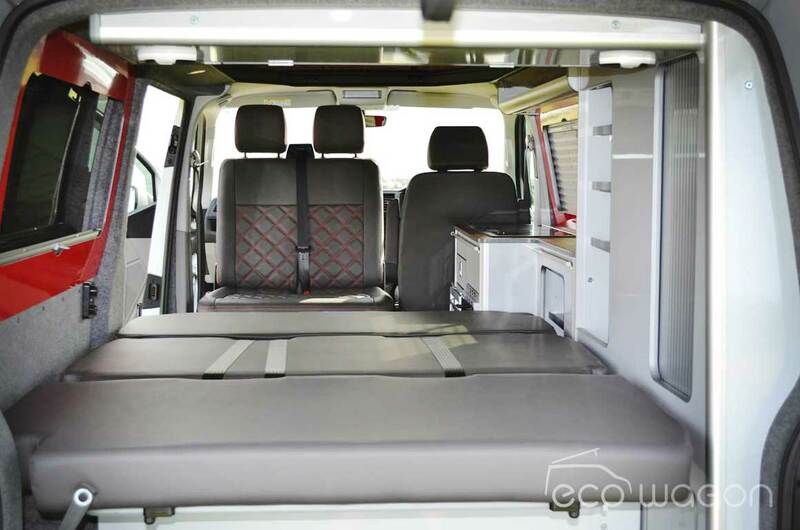 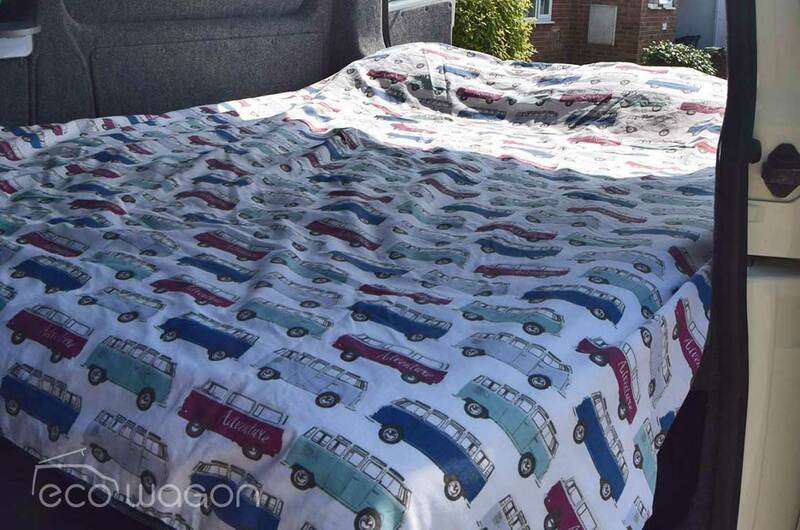 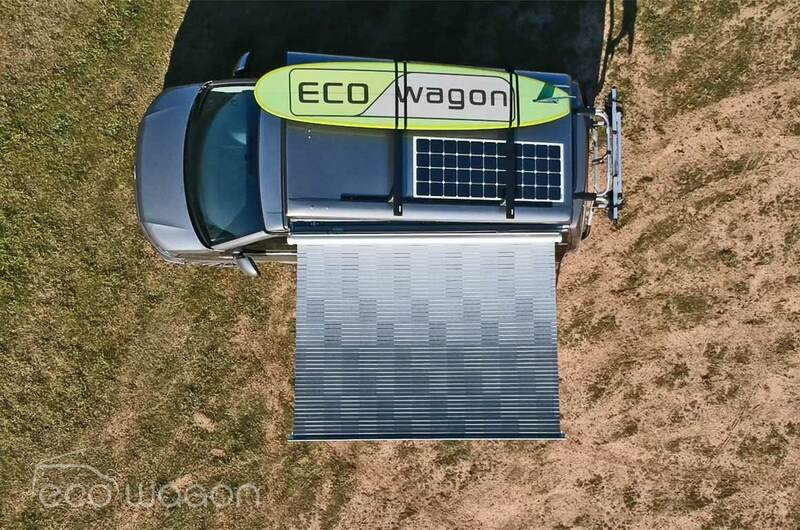 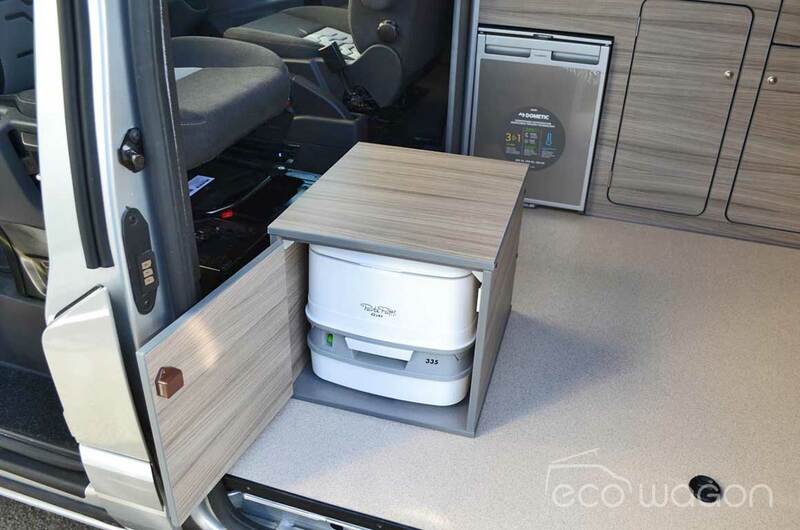 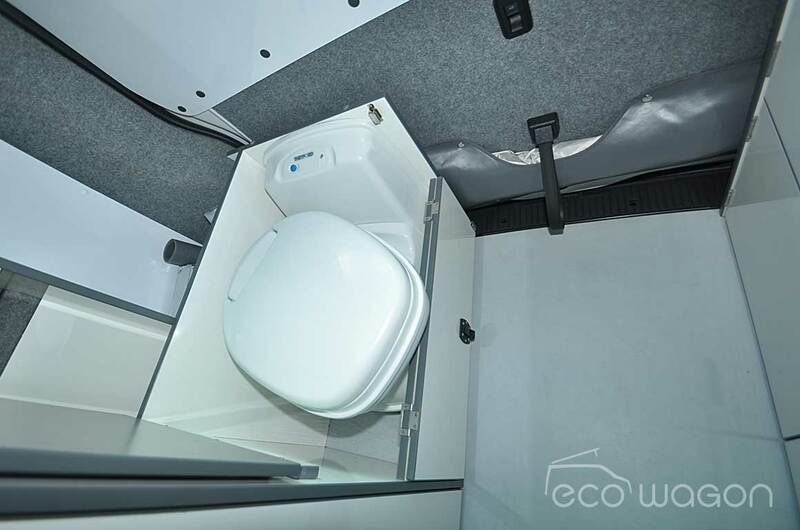 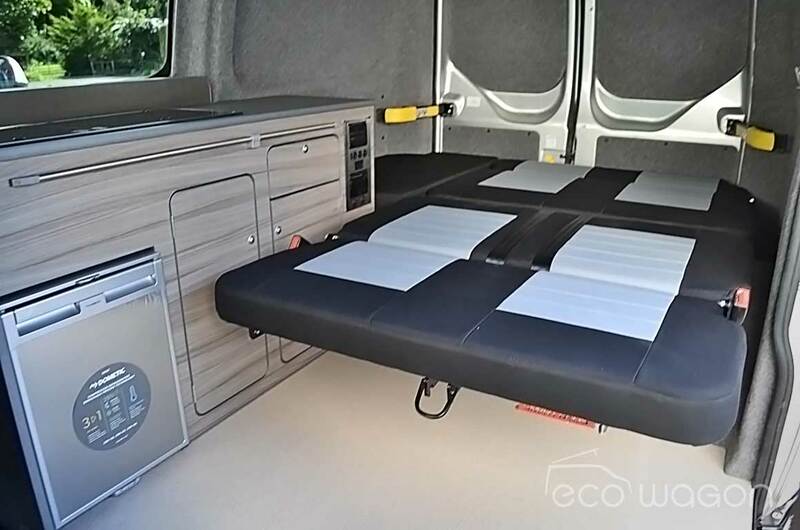 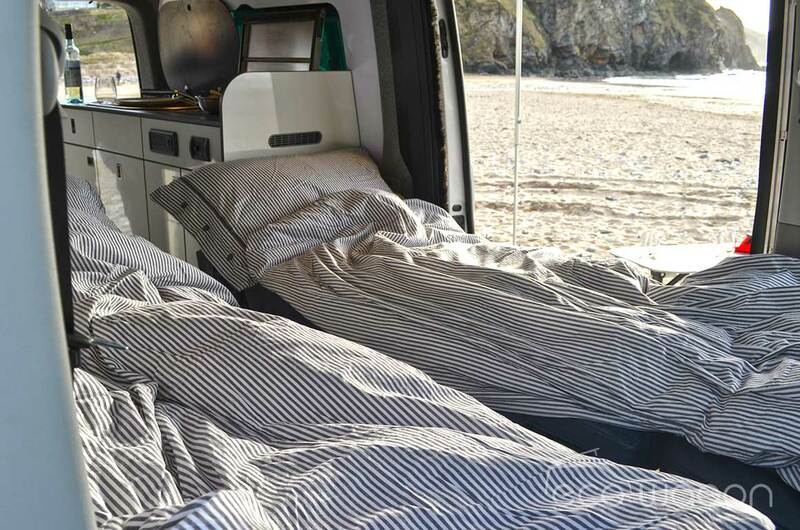 Ecowagon have also developed a bespoke pop top bed system which doubles as a crisply finished inner roof liner for your van. 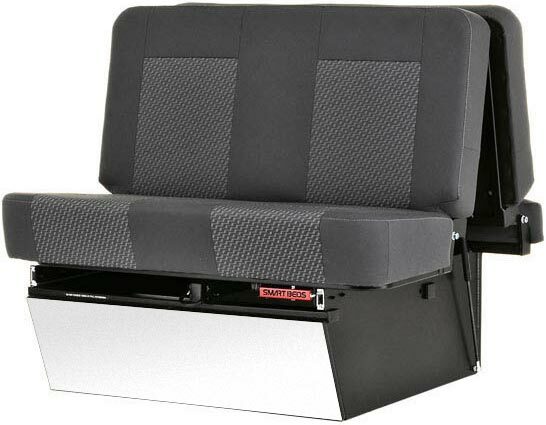 Easy to access, comfortable and simple to use. 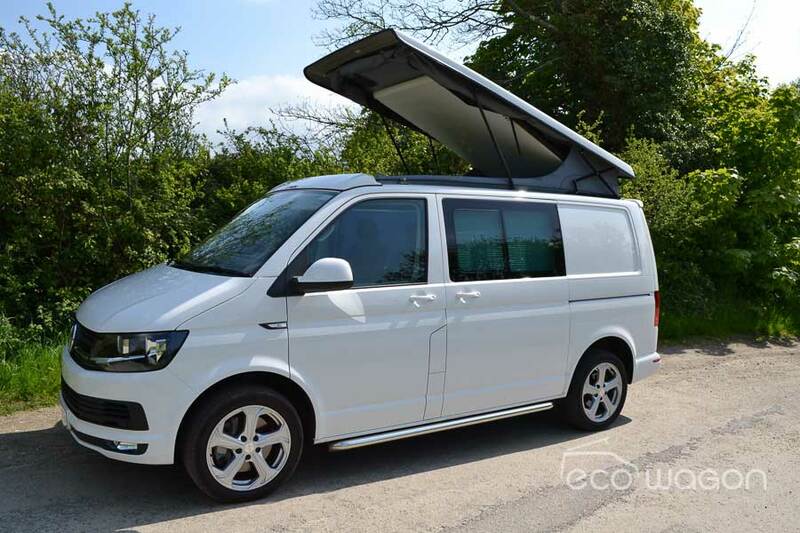 LOOKING FOR A NEW OR PRE-OWNED VW T6? 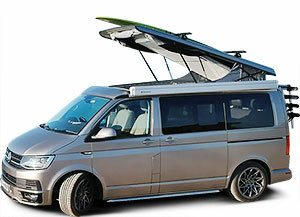 We have dealer network access to over 300 VW T6 and T5 Transporters. 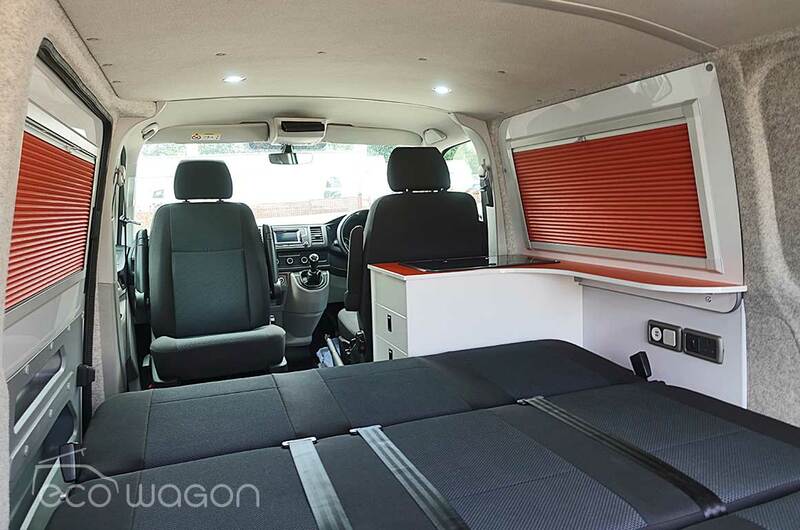 Pre-reg, new or pre-owned, chances are we have the perfect van for your dream Ecowagon conversion. 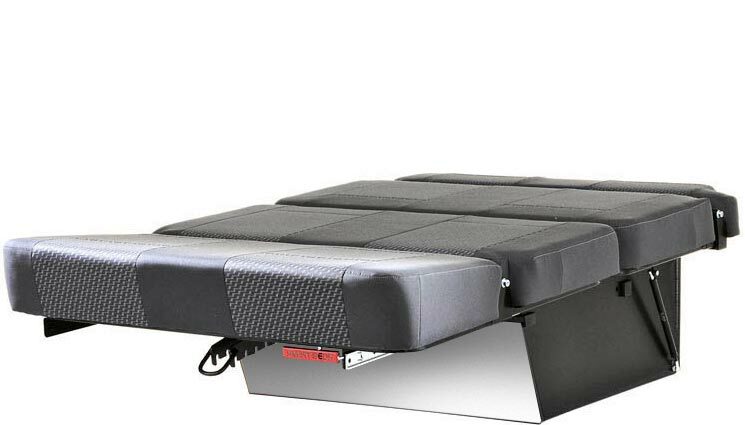 Great deals and excellent value. 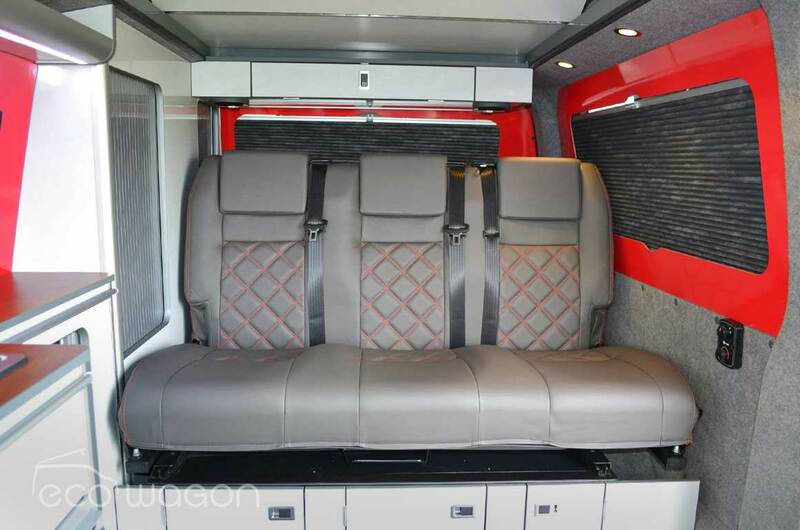 We have dealer network access to over 300 VW T6 and T5 Transporters. 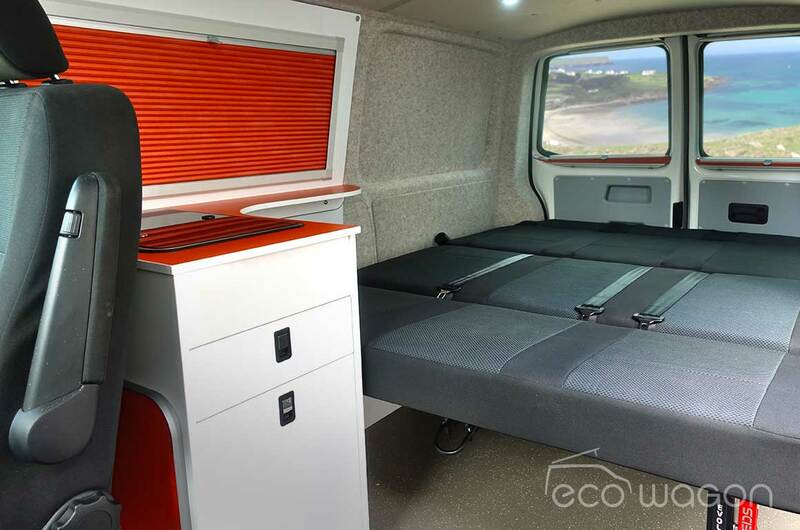 Pre-reg, nearly new or used, chances are we have the perfect van for your dream Ecowagon conversion. 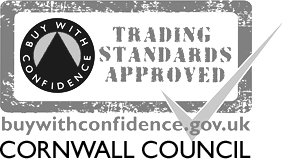 Great deals and excellent value.